The Aber Falls, above the village of Abergwyngregyn, is well known as a stunning visitor attraction in the Snowdonia National Park. 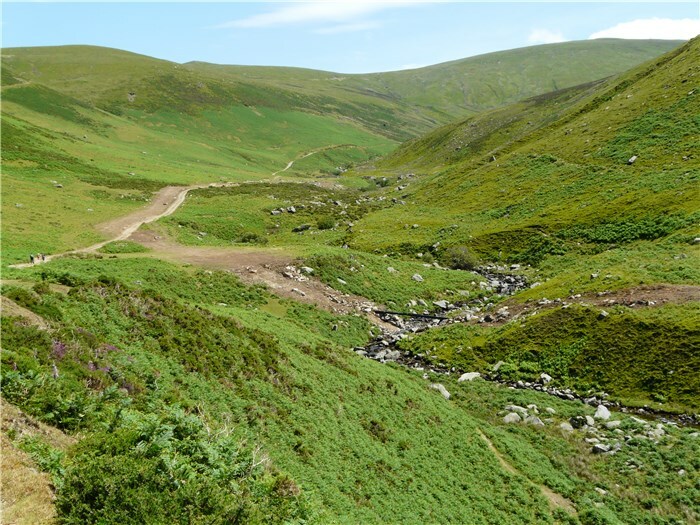 Here in the village, known locally as Aber, we are pleased to be able to welcome some 50,000 visitors a year who enjoy the walk up to the Aber Falls and beyond into the Carneddau range. 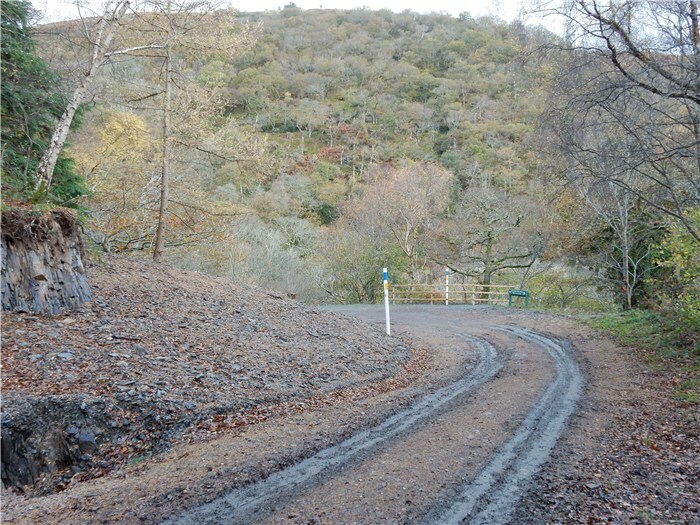 Some drive up and take advantage of one of the two car parks we run (just £2 a day and all funds go to improving amenities in the village), others park in the free car park at the bottom of the village and walk up the valley. Choosing this second option takes you past Tŷ Pwmp, which houses a small exhibition of the history of Aber and the Princes of Gwynedd who had a court here, and Yr Hen Felin (The Old Mill) Community Centre and café. 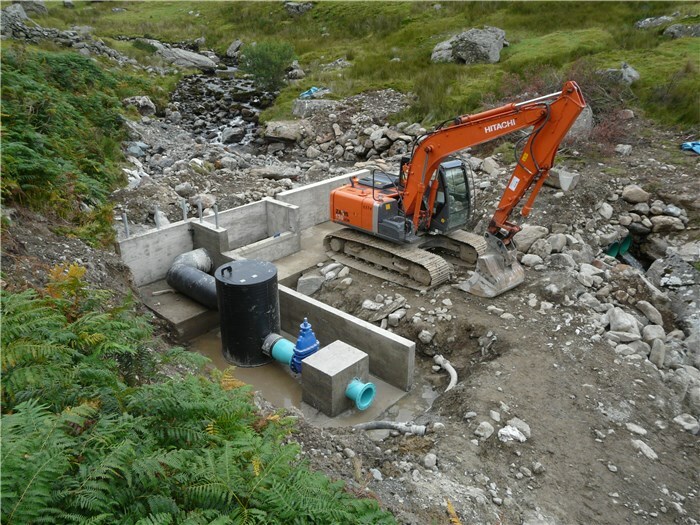 The Anafon Hydro Scheme is the most recent community venture in Abergwyngregyn. 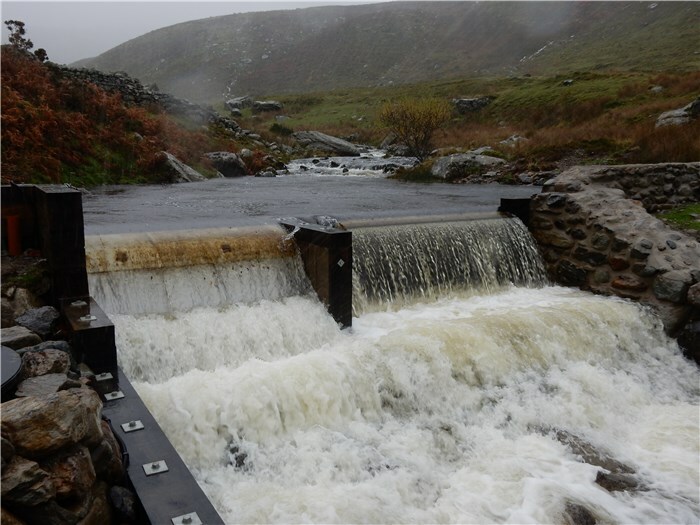 It is not the power of the Aber Falls that is driving the hydroelectric generating plant but water from the nearby Anafon valley, taken out of the river high in the Carneddau and returned downstream once it has passed through our turbine. 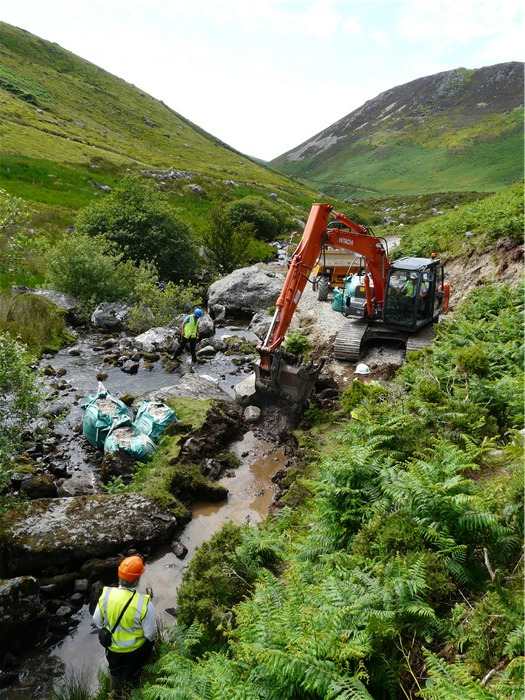 The scheme is owned and managed by Ynni Anafon Energy Cyf, a Community Benefit Society set up to build and run this community hydro project. 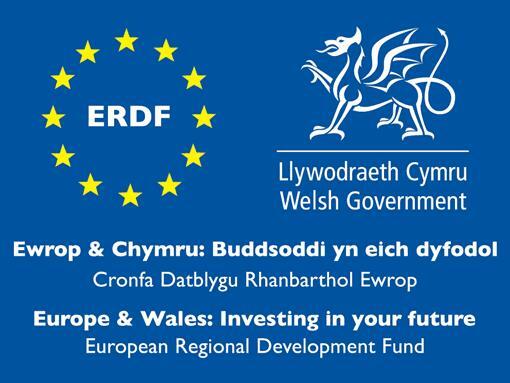 earn significant income to support energy efficiency and infrastructure and social initiatives in Abergwyngregyn and the wider local community. 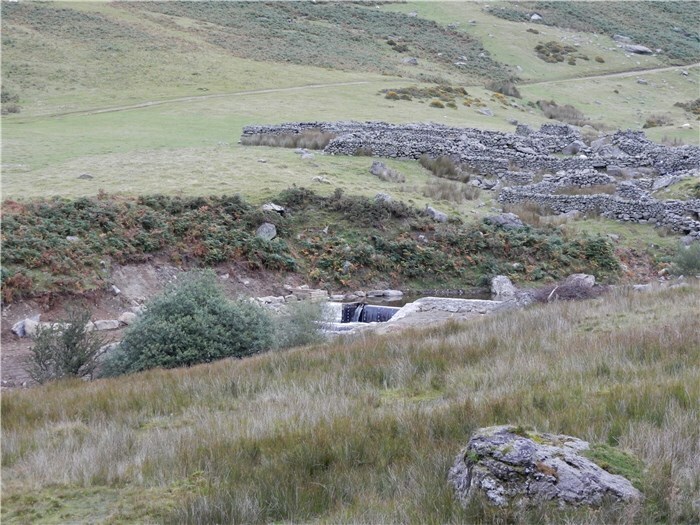 The Anafon Hydro was conceived by Directors of the Abergwyngregyn Regeneration Company (ARC) working with Keith Jones from the National Trust, the main landowner in the Anafon Valley. ARC is a social enterprise and a Company Limited by Guarantee incorporated in 2002. 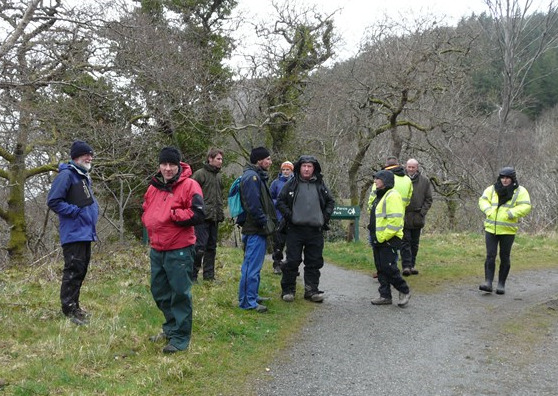 It is managed by a Board of 12 volunteer directors and 3 co-opted members drawn from the community of Abergwyngregyn. The directors of ARC provide a broad mix of experience including planning, general and financial administration, the law, company management, university education, health care and administration, catering and hospitality, accountancy, biological sciences and ecology. 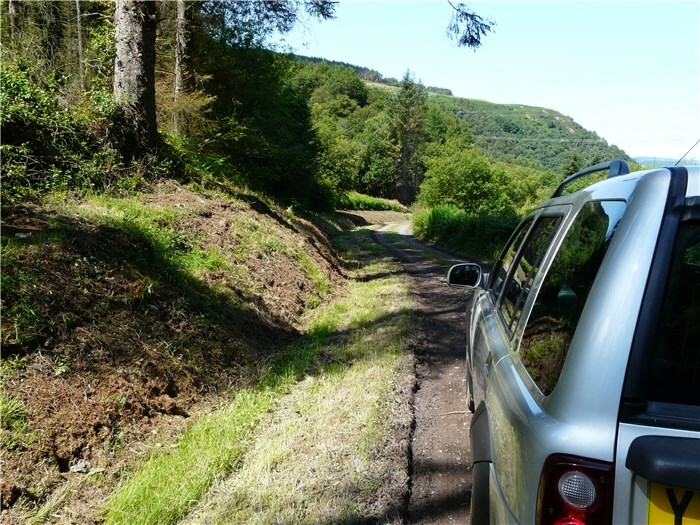 entering into a management agreement with Natural Resources Wales to operate the Forestry car park which also serves the Aber Falls and valley - these car parks currently provide the company with its main income stream. 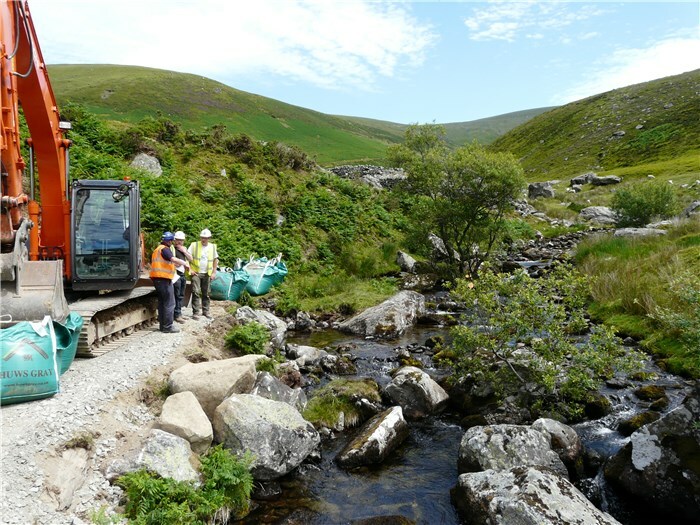 In 2010, in partnership with the National Trust, ARC started to explore the feasibility of developing a hydro-electric scheme on the Afon Anafon above the village and a decision was taken to proceed with the project. 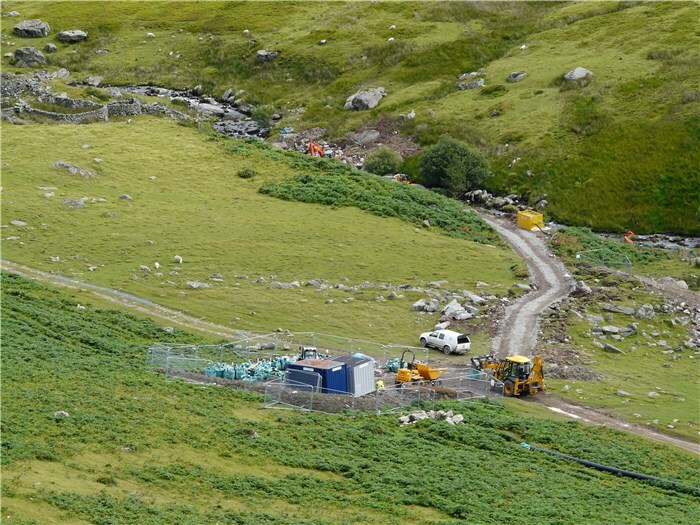 The initial phases of development, including conducting detailed feasibility studies and obtaining the necessary consents and permissions, as well as the construction of the hydro in 2015 were managed by a small group of Directors of ARC, Jacqui Bugden, Gavin Gatehouse and Hywel Thomas acting in a voluntary capacity with technical and other expert support. Ynni Anafon Energy Cyf. 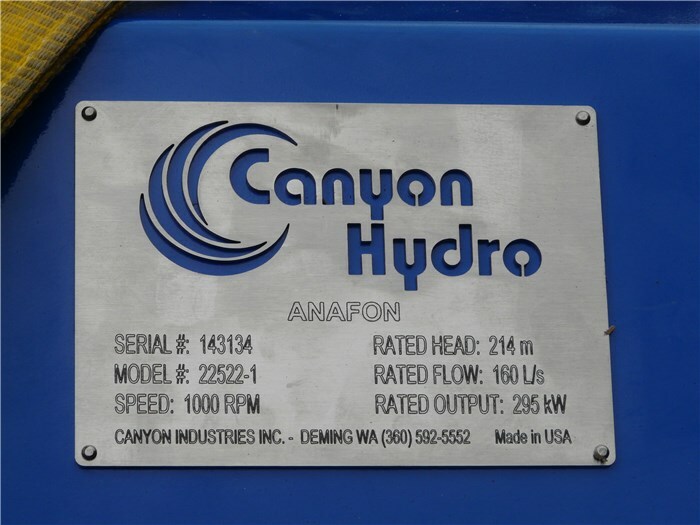 was established in 2014 to complete the development of the Anafon Hydro and to operate and manage it after commissioning. The Society was registered with the Financial Conduct Authority on 11th June 2014 (registered number 32406R). This legal structure, a Community Benefit Society, is regulated by the FCA and governed by specific Rules based on model rules developed by Cooperatives UK. all disposable profits will be invested in the local community. Ynni Anafon Energy Cyf. (YAE) is an independent Society and not a subsidiary of the Abergwyngregyn Regeneration Company Ltd (ARC). However, its three founding Directors, Jacqui Bugden, Gavin Gatehouse and Hywel Thomas were also Directors of ARC. On 1 May 2015, Ynni Anafon Energy Cyf shareholders elected the new Board of 9 Directors. These elected Directors bring to the Board a broad mix of experience including accountancy, general and financial administration, banking, town planning, the law, company management, university education, health care and administration, catering and hospitality, biological and physical sciences and ecology. All Directors act on a purely voluntary basis. Gavin has lived in Abergwyngregyn since 1973 and raised his family in the village. He retired in 1998 after 26 years in the University of Wales, Bangor and a period as Head of the School of Biological Sciences so has experience of general, personnel and financial administration in a large university department. 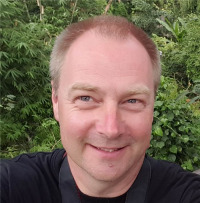 This role and his research interests in tropical entomology involved him with national and international government and private sector organisations in the UK, Africa, the Far East, Australia and the Americas. He has been active in community initiatives and enterprises in Abergwyngregyn, as a community councillor, a founder Director and past Chair of the Abergwyngregyn Regeneration Company and member and past Chair of the Aber Heritage Valley Partnership. He is now founding Chair of Ynni Anafon Energy Cyf. Hywel’s family has lived in Abergwyngregyn for seven generations and he himself has lived here with his family since 1988. Following 38 years experience in Planning, he recently retired as Development Control Manager with Gwynedd Council Planning Department. He has experience of working on community projects since 2000 including the £470,000 Yr Hen Felin/The Old Mill renovation project which has delivered a Community Centre, Cafe and Community Club. 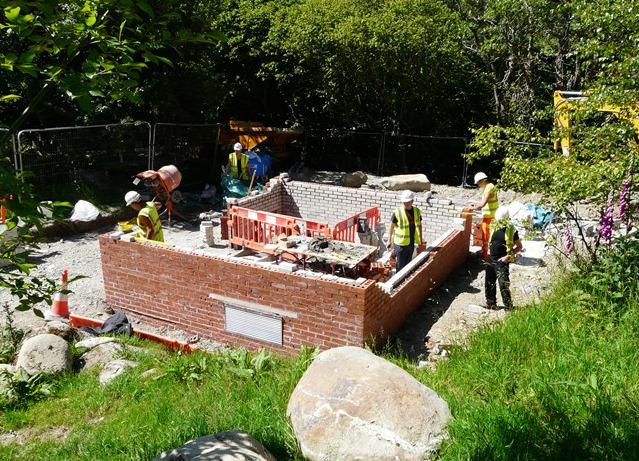 For this project the Abergwyngregyn Regeneration Company was awarded the Queen’s Award for Voluntary Service. Currently Chairman and Director of the Abergwyngregyn Regeneration Company, he is also Secretary of Ynni Anafon Energy Cyf. 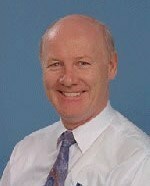 Ian is a chartered accountant who has held the post of finance director in several small companies including a plc. He’s also been involved in the project management of construction, mining and engineering works in the UK and overseas and more recently a non-executive director or governor of a number of smaller organisations. He lives in Bangor and has been in North Wales since 1970. Wynn’s family have lived in Aber for generations and he was born and has lived his whole life in Abergwyngregyn. 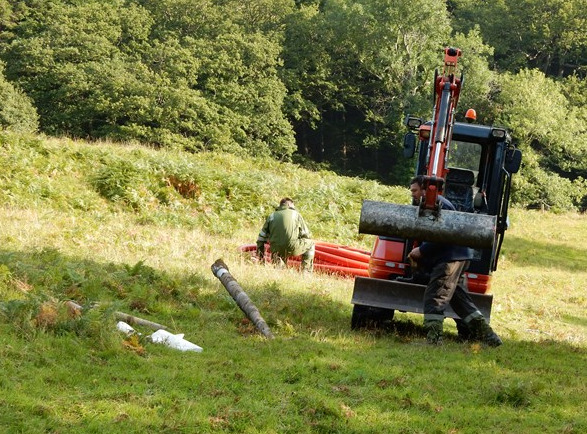 He farms above the village and is also a fencing contractor. 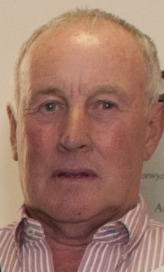 Wynn has played a prominent role in community affairs for many years, serving as a Community Councillor, Director of the Abergwyngregyn Regeneration Company with particular responsibility for servicing the Aber Falls car parks, and will be a Trustee of Dŵr Anafon, the charity set up to distribute the disposable profits of the hydro for community benefit. Working for the National Trust as an Environmental Advisor for the last 9 years Keith is also the lead for renewable energy generation for the National Trust within its £30m renewable energy investment program.Prior to this and following his first class degree in Environmental Planning he was the National Trust Head Warden and then Countryside Manager for Snowdonia which included managing the 4000acre Snowdon farm. 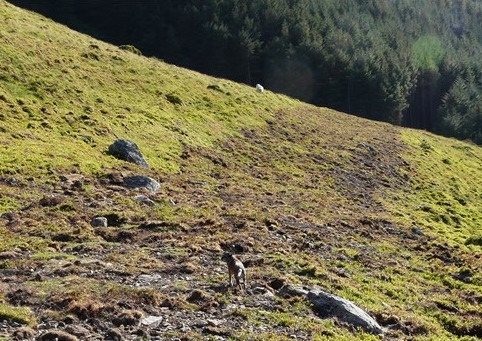 At this time he was also one of the founders of the Welsh Institute of Countryside and Conservation Management. 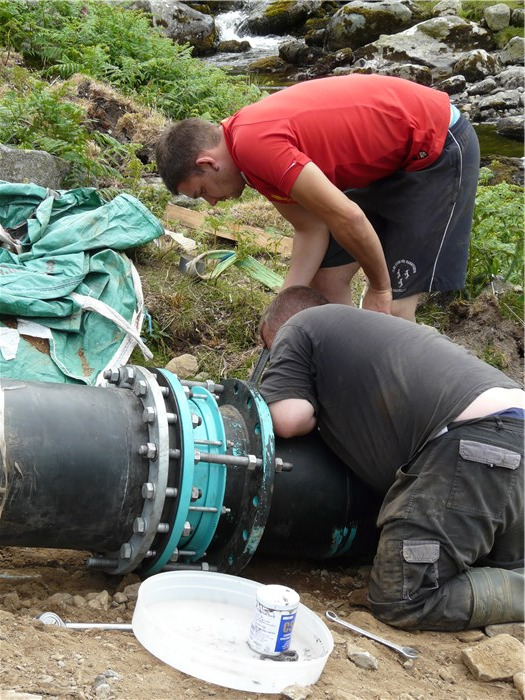 He currently specialises in hydro development having been involved in 7 completed hydro systems to date and leading on the development of a further 16. He regularly advises organisations and governments on aspects of distributed generation. 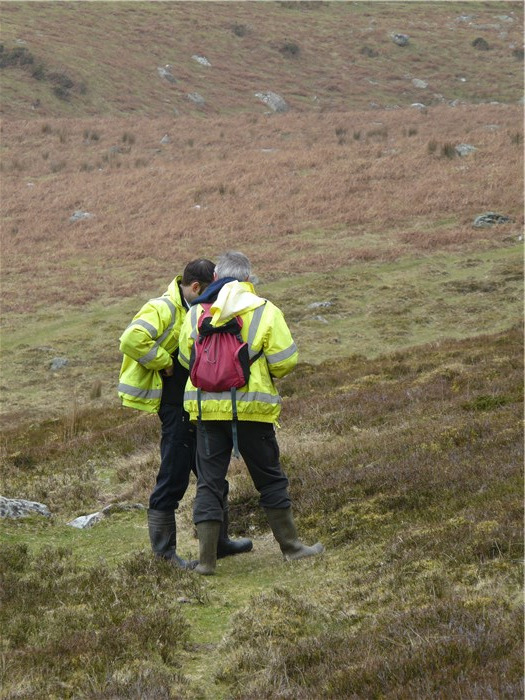 He is a steering group member of the Community Energy Wales Developments Fund and also sits on the climate change commission Wales land use group. As a previous winner of the Ashden Gold award he and a colleague founded the UK wide ‘fit for the future’ network which brings many of the largest NGO’s and landowners together to learn and share about sustainable energy. He actively works within the community sector. 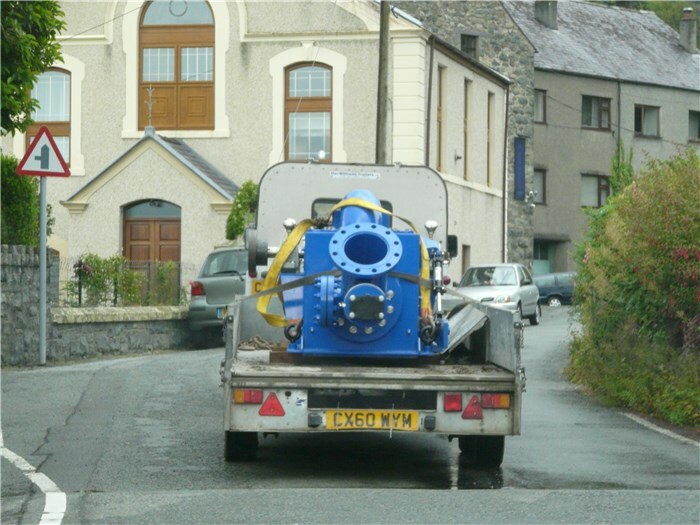 Director of the Anafon Community hydro, Ynni Padarn Peris and Ynni Padarn Peris as well as helping many other community energy companies. He was selected as the Institute of Welsh Affairs environmentalist of the year 2014 and was awarded the honorary title of Lecturer by the University of Bangor 2015 and was shortlisted as a community energy champion by Community Energy England. A freelance lecturer on sustainability for the Cardiff and New York Universities and this year he represented the 67 National Trusts globally at the Paris Climate change talks. He actively blogs and shares freely as well as being one of the Environmental experts for the last 15 years on the BBC radio Cymru Galwad Cynnar as well as a regular commentator on energy maters for the BBC in Wales. I am a recently retired GP, leaving after 30 years in the NHS. I worked the majority of that time as a GP partner in Betws-y-Coed. During my career in addition to clinical skills I had to develop expertise in the areas of management and governance. I am very used to attending meetings! I am married to Stephen also retired from the NHS where he was a GP and a community paediatrician. We have two grown up children who were born and raised in North Wales. They speak welsh but the welsh language is an ongoing project for me. We lived for 21 years in Conwy and moved to Aber nearly 5 years ago. 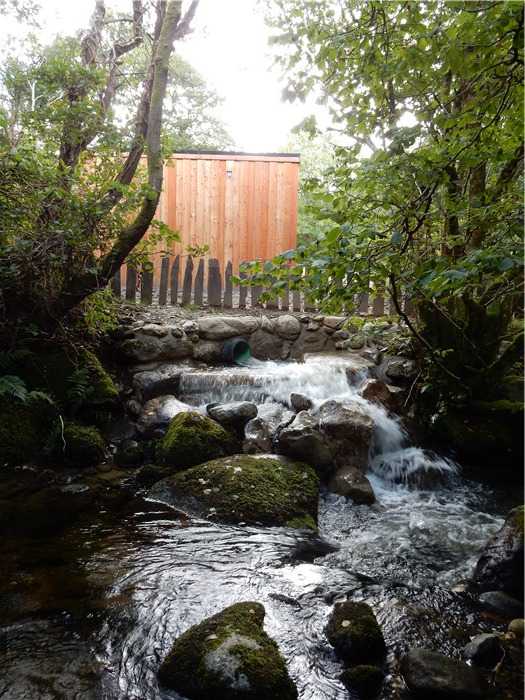 Aber has proved to be an incredibly welcoming and dynamic community as the hydro project demonstrates. I have been so impressed by the dedication and tenacity of those involved to get this fantastic project up and running. I am honoured to serve as a board member and hopefully make a useful contribution. Linton has lived in Abergwyngregyn for 18 years with his wife Philippa and their three daughters. He was born in Bangor Gwynedd, and educated at Ysgol Friars, Bangor. He studied Naval Architecture and Offshore Engineering at the Department of Marine Technology; University of Strathclyde, Glasgow. Following graduation in 1994, he joined Cammell Laird in Birkenhead as a Naval Architect. 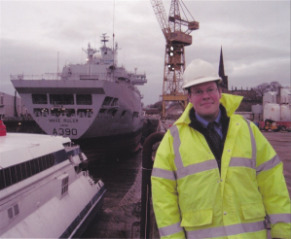 Cammell Laird is one of the largest shipyards in the UK and during a 22 year career he has worked in various technical, production and project management roles culminating in promotion to Managing Director of the Company in 2008. 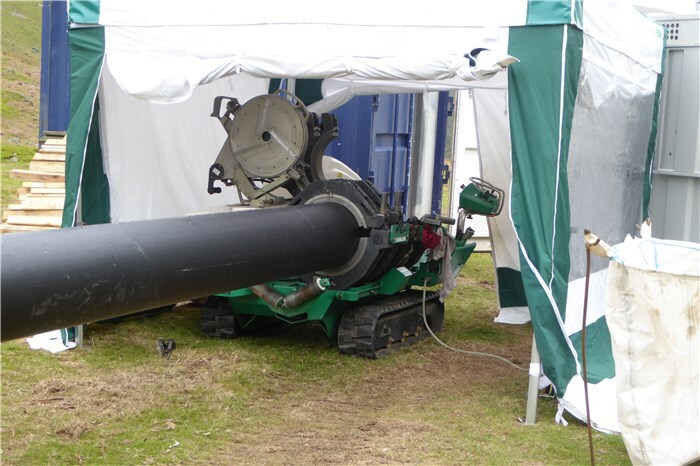 In his career Linton has had responsibility for the delivery of numerous, highly complex, multi-million pound construction and engineering projects. 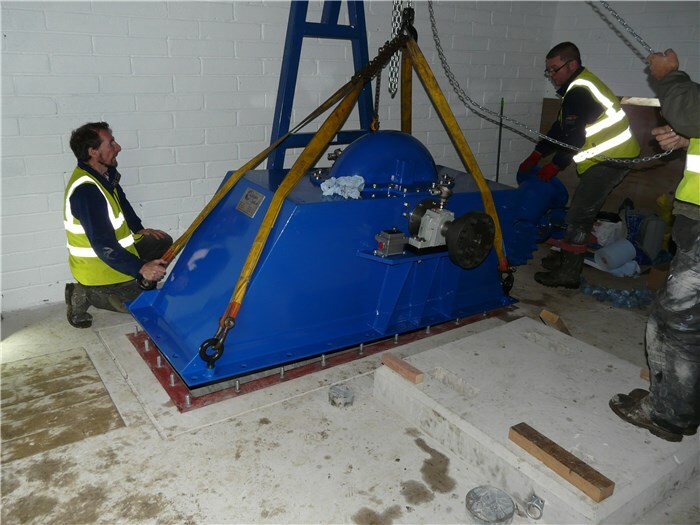 Linton now has operational responsibility for the Company and the activities of over 1000 people working there. The Company is currently constructing the new £200m UK research ship 'RRS Sir David Attenborough'. As well as his role as Cammell Laird, Linton is member of the Lloyds Register Technical Committee (an advisory group to the Marine Classification Society) and a trustee of the Kathleen & May (Heritage Schooner) Trust. 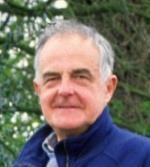 Martin is a native of North Wales and has lived in Llanfairfechan since 1972. He retired in 2010 after 40 years in Bangor University during which time he was appointed Head of Electronic Engineering for 6 years and Dean of Science and Engineering for 3 years. As Head of Electronic Engineering he was also appointed to the Board of IDB (UWB) Ltd which, until recently, was a wholly-owned subsidiary of Bangor University. During his tenure as Dean, he was a member of the University’s Planning and Implementation Group. He has acted as a consultant for companies ranging from SMEs to major multinationals advising on production problems related to static electricity. 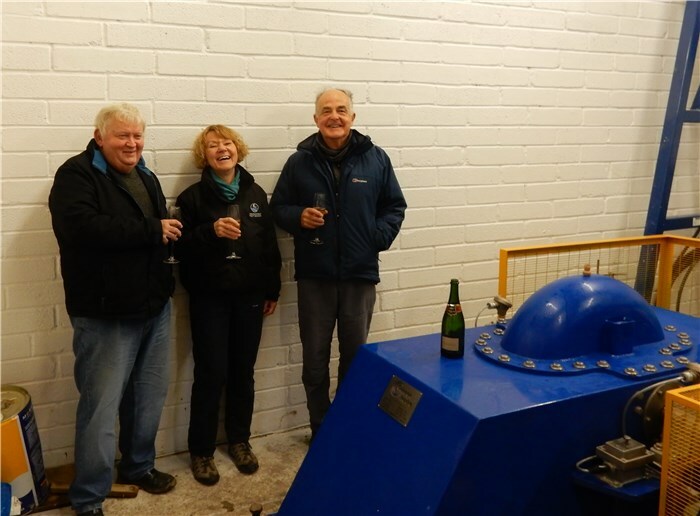 For many years he was the Treasurer and a Trustee of Llanfairfechan Sailing Club and was recently elected to the Board of Ynni Anafon Energy Cyf. A semi-retired electronic design engineer, Aled currently undertakes development projects at a local environmental research establishment. A Bangor University graduate, he specialised in automatic test equipment design for aviation systems at Cheltenham. 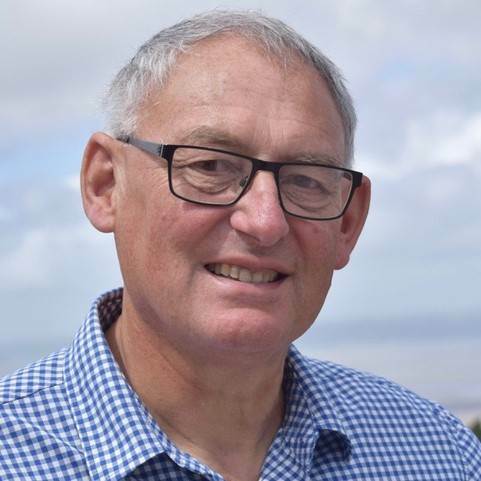 He moved to Llanfairfechan in 1984 with his family and worked on geotechnical instrumentation and medical robotic systems design for local companies. He joined IDB, Bangor University in 1992 where he completed numerous projects until 2010. 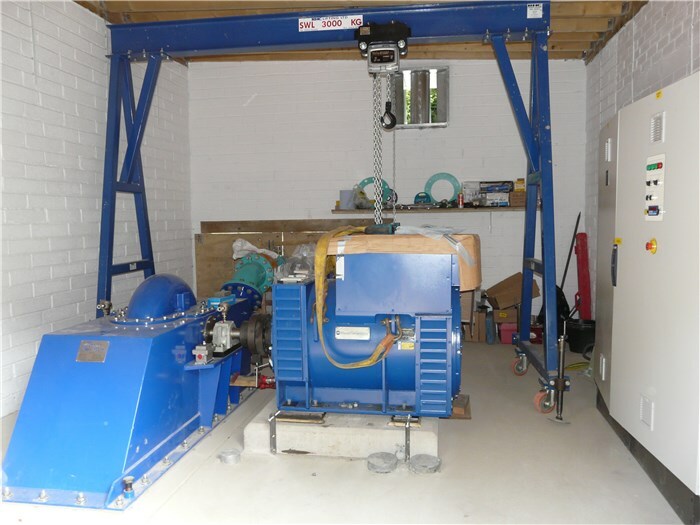 These were mainly bespoke instrumentation and control systems for establishments including the MOD, the Magnox and local hydroelectric schemes. 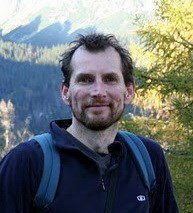 A trustee and organist at a local chapel, his main interests are choral singing, mountain walking and clock repairing. Nikki has lived in Abergwyngregyn since 2006 working locally as a General Practice Nurse. Her nursing career spans 50 years covering a number of specialties. Though now semi-retired, she continues to run an anti-coagulation clinic in the neighbouring village of Llanfairfechan. She has been a member of the Abergwyngregyn Regeneration Company for three years, joining the board of Directors in 2015. 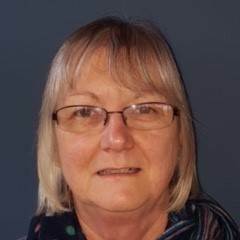 Committed to the concept of renewable energy she has been an enthusiastic supporter of the Ynni Anafon Energy hydro project for two years and was co-opted to the Board in 2015. 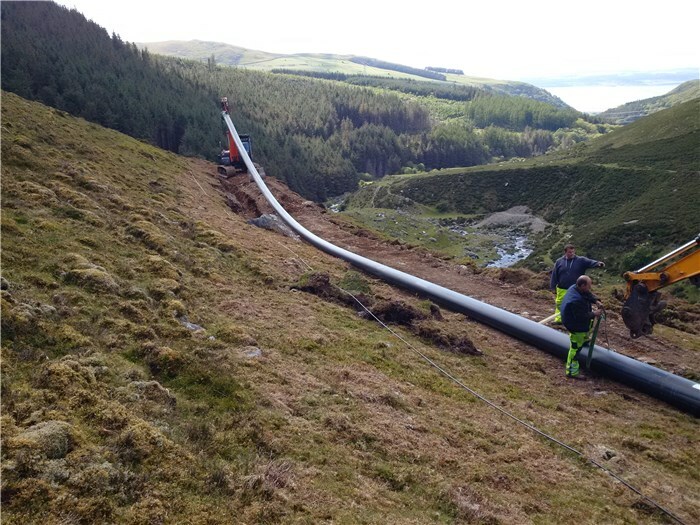 The disposable profits generated by the hydro will be transferred to a new charity, Dŵr Anafon, set up by the Abergwyngregyn Regeneration Company to distribute the money for the benefit of local communities. The Trustees of this charity will be representative of the communities designated to benefit from the project and will consider applications for funding from these communities. The decisions of the Trustees of the charity with regard to any application for funding received will be final. The three Founder Directors of Ynni Anafon Energy Cyf. Hywel’s family has lived in Abergwyngregyn for seven generations and he himself has lived here with his family since 1988. Following 38 years experience in Planning, he recently retired as Development Control Manager with Gwynedd Council Planning Department. 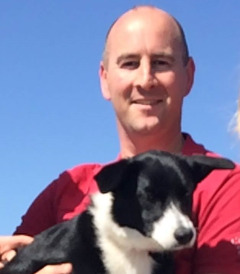 He has 12 years experience working on community projects including the £470,000 Yr Hen Felin/The Old Mill renovation project which has delivered a Community Centre, Cafe and Community Club. 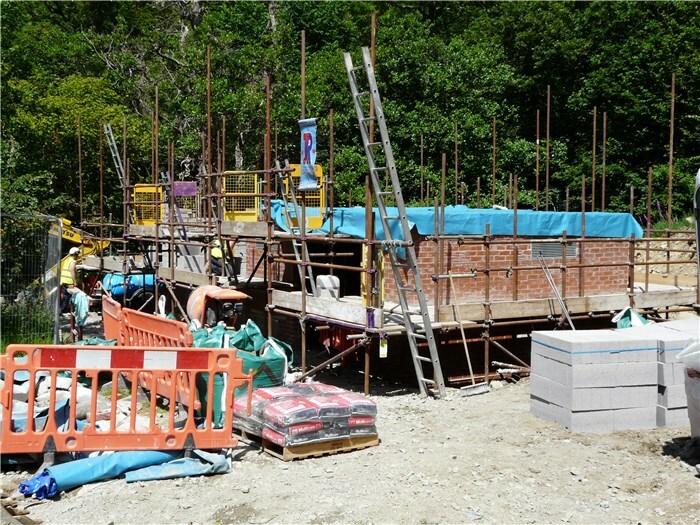 For this project the Abergwyngregyn Regeneration Company was awarded the Queen’s Award for Voluntary Service. Currently Chairman and Director of the Abergwyngregyn Regeneration Company, he is also Secretary of Ynni Anafon Energy Cyf. Jacqui came to live in Abergwyngregyn in 2011 where she and her partner, Ian, have built a prize-winning new house. 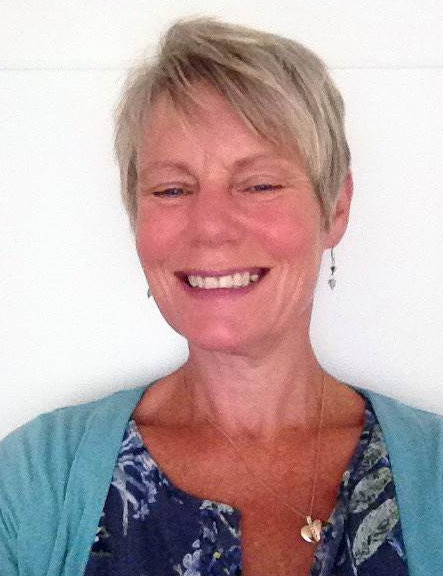 Jacqui retired as a psychologist in 2011, having run a business providing psychologist expert witnesses for the Court. Now running a yacht broking business, she has wide experience in business management, human resources, training and presentation and legal issues. 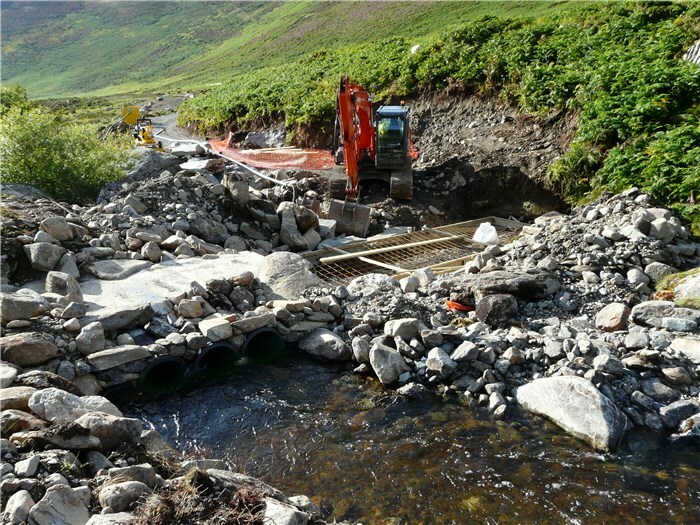 She joined the Abergwyngregyn Regeneration Company as a Director in 2012 and has been active in the community ever since, having been a core member of the group developing the Anafon Hydro Project. She is now a Director, with Gavin and Hywel, of Ynni Anafon Energy Cyf. 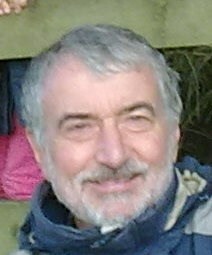 Keith Jones is the National Trust environmental advisor and is the national specialist for the Trust on hydro development. 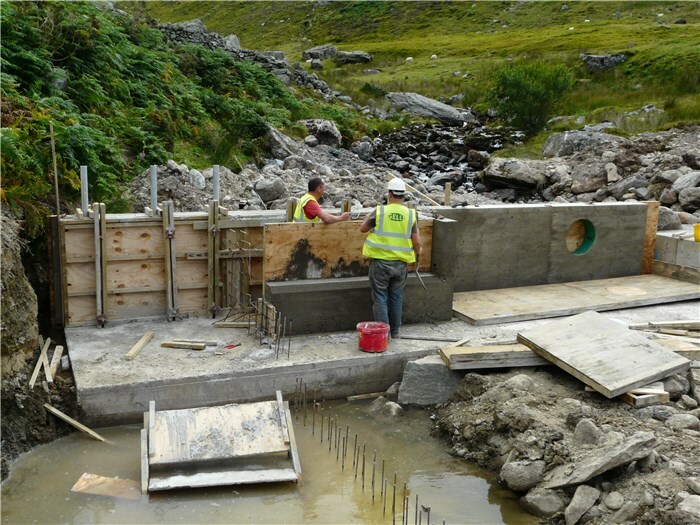 He has led for the National Trust in the development of 5 completed hydros to date, including the award-winning Hafod y Llan hydro on Snowdon. 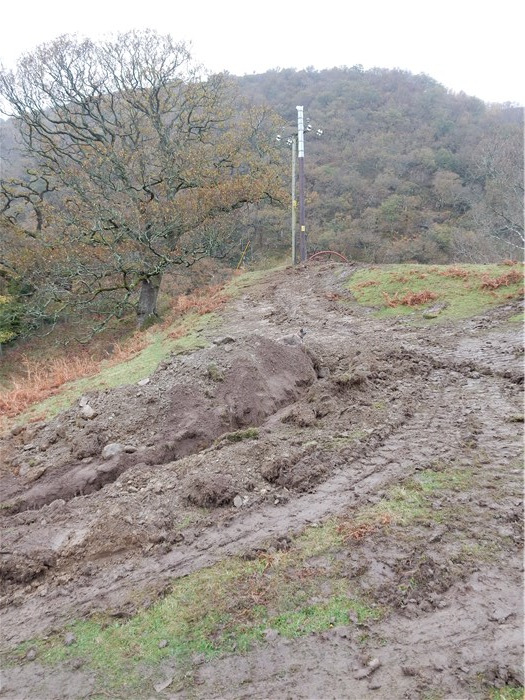 Keith is a passionate advocate for community renewable energy and is a Director of Ynni Padarn Peris as well as currently assisting in the development of 6 more community energy projects. 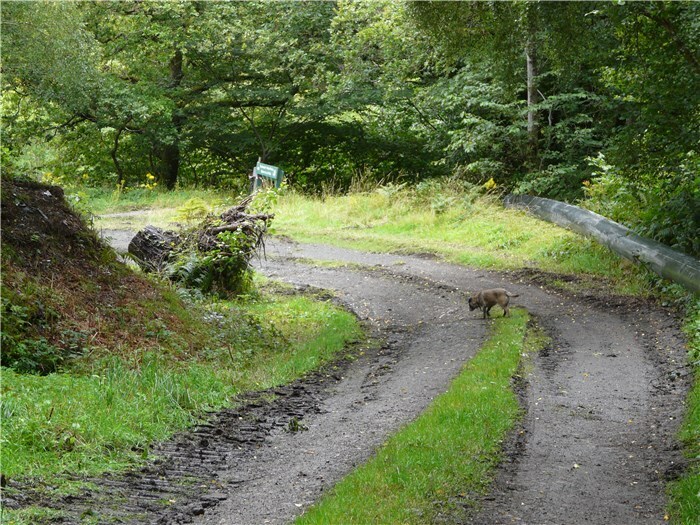 One of the founders of "Natur", the Welsh Institute of Countryside and Conservation Management, he is also a member of the 'Fit for the Future' UK network. He is this year's Institute of Welsh Affairs 'Environmentalist of the Year'. Keith has recently taken up an appointment as Government Advisor on Renewables and Community Energy and is a member of the Steering Group of the Community Energy Wales Development Fund. John is the Technical Consultant to Ynni Anafon Energy Cyf. 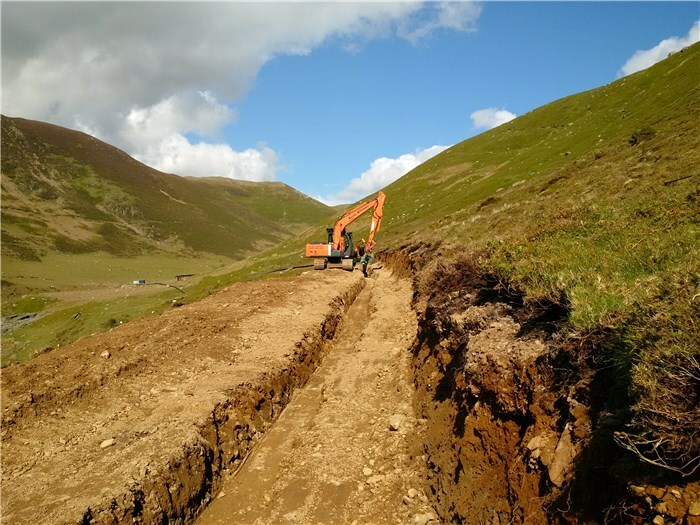 He is an independent hydropower engineer with 17 years successful experience in development, design, project management and implementation of hydropower projects in Wales and Scotland. 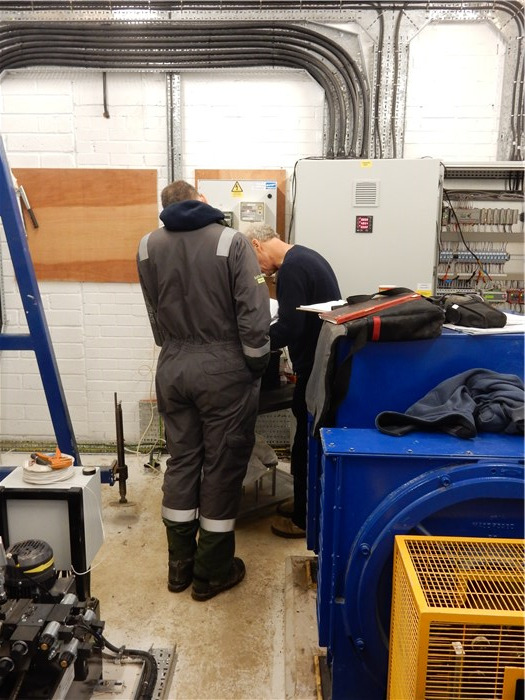 He is a hydropower lecturer on the Renewable Energy MSc course at the Centre for Alternative Technology and is on the Bro Dyfi Community Renewables wind turbine management committee in Machynlleth. 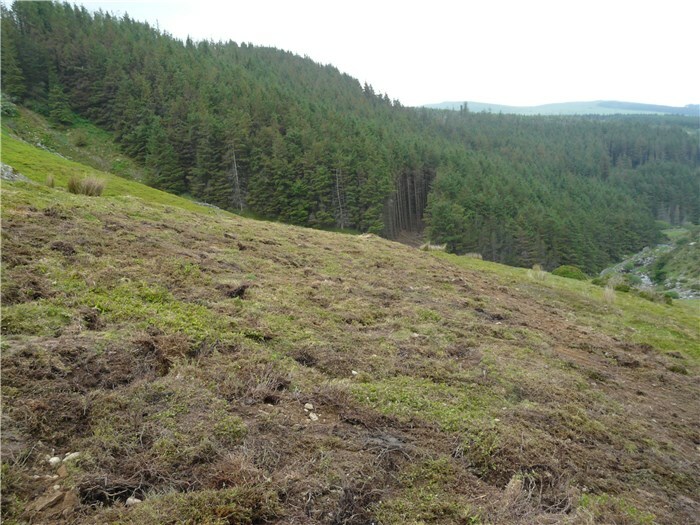 He has lived and worked in Mid Wales since 1997. 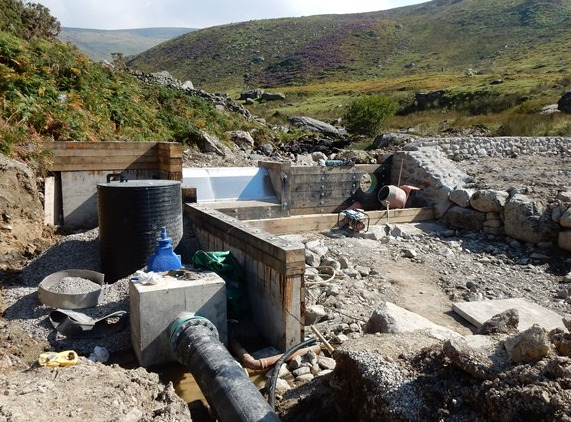 His most recent contract was consultant design engineer and technical project manager for the 650 kW, award winning Hafod y Llan hydro scheme for the National Trust, located on the south side of Snowdon. 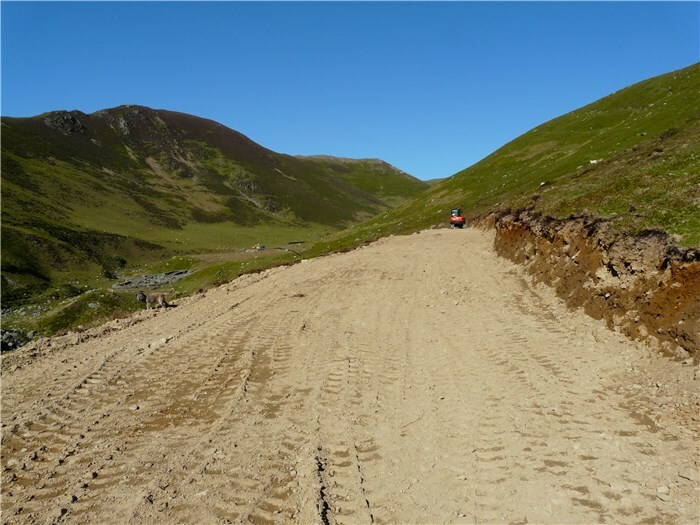 John was responsible for the project from initial pre-feasibility stage through to construction and commissioning, negotiating all licences and planning permissions, undertaking detailed design, equipment specifications, technical project management and site supervision of construction contractors. 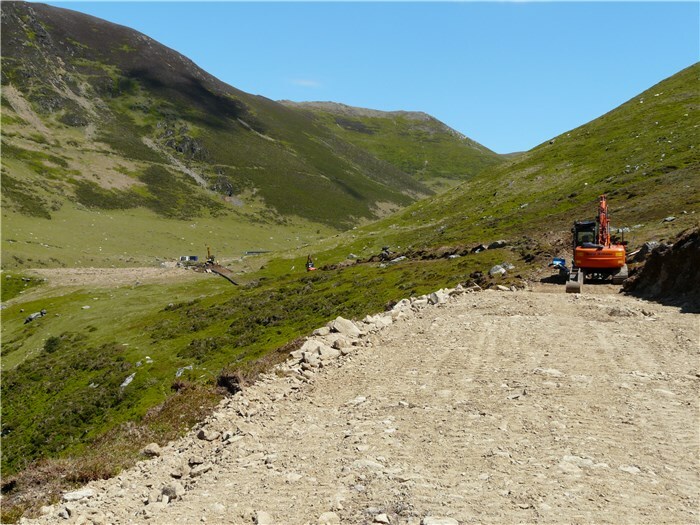 He is undertaking the same role for the Anafon project to date, and will continue with the project to construction, completion and subsequent operation and management. 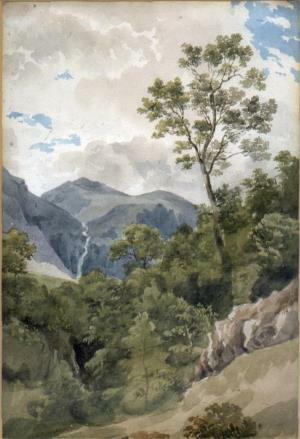 The site of the Anafon Hydro lies in the Anafon valley in the Carneddau massif which rises immediately south of the village of Abergwyngregyn just inside the northern boundary of the Snowdonia National Park and 4 km west-south-west of Llanfairfechan. The Afon Anafon originates in Llyn Anafon, a small, disused reservoir 5.1 km south-east of Abergwyngregyn village. 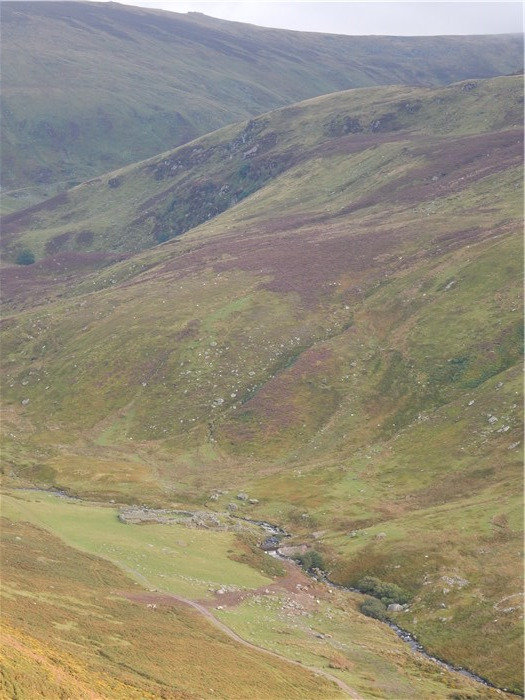 The river descends rapidly for 3.3 km through open moorland and then through Coedydd Aber Forest to join the Afon Rhaeadr Fawr immediately upstream of Bontnewydd. 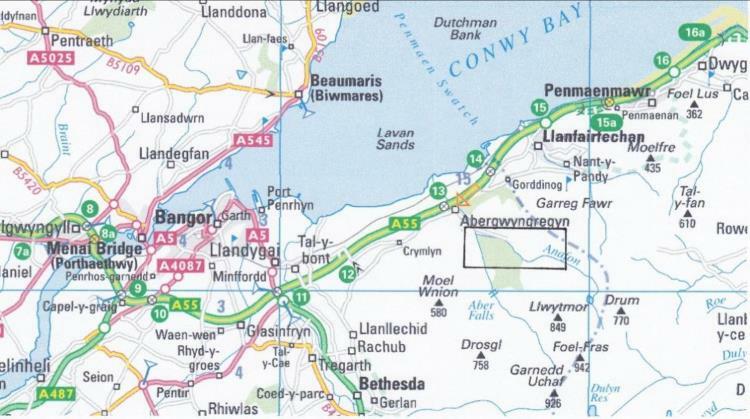 The two tributaries form the Afon Aber which runs a further 2.3 km through the village and farmland to enter the eastern end of the Menai Strait at Traeth Lafan. 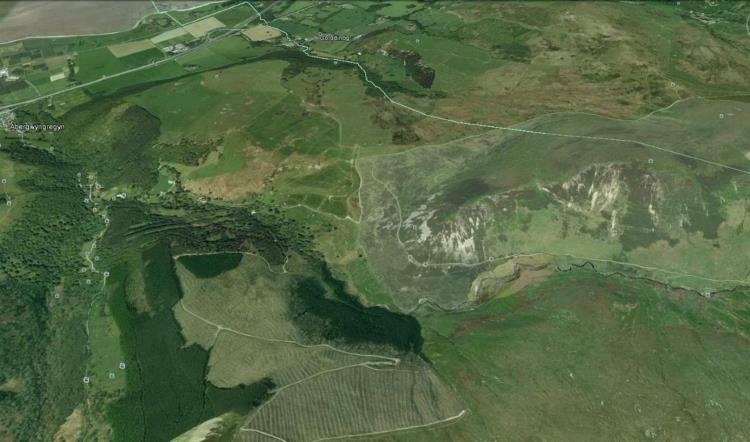 The total descent of the river from Llyn Anafon is 558 m over 5.6 km. 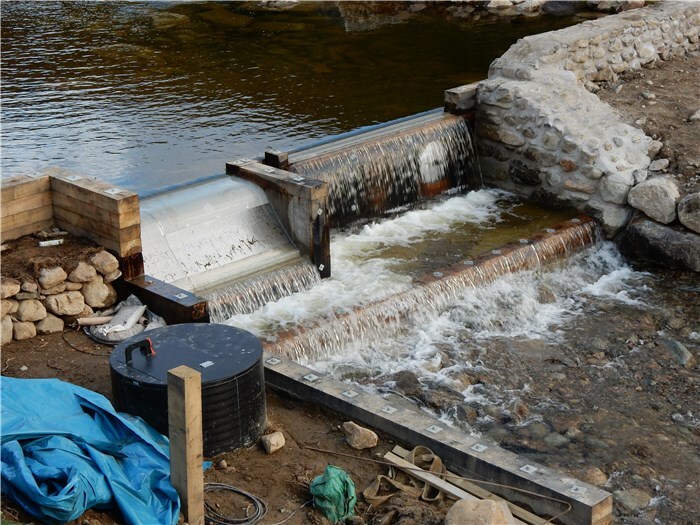 The intake weir will be situated 1.4 km downstream of the lake providing a catchment of 5.05 km2 and a head of 230m. 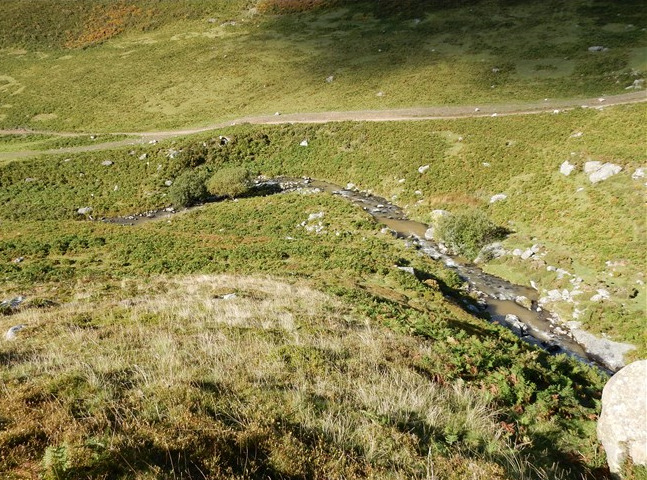 The Anafon Hydro is a high-head run-of-river scheme. 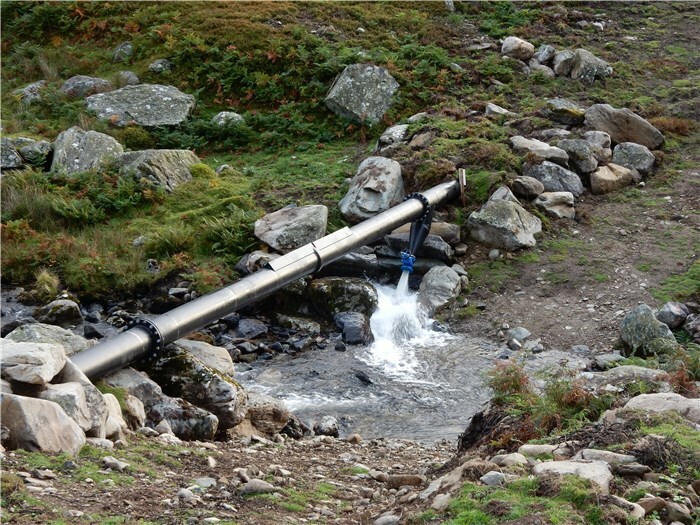 A low weir feeds water into a buried 3 km pipe. 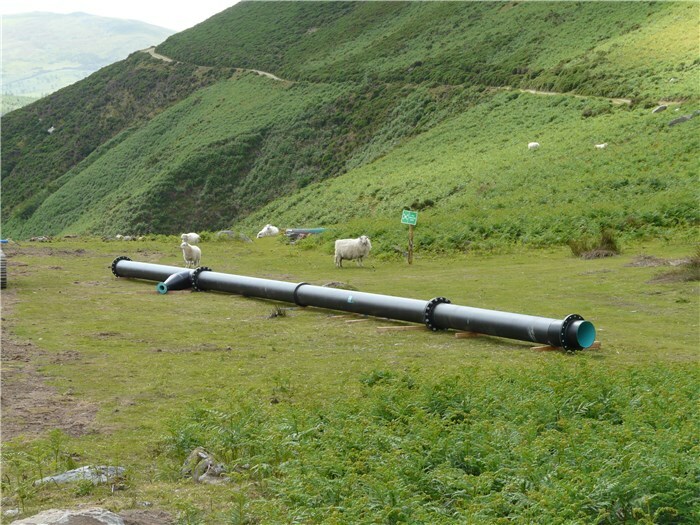 The pipeline descends a total of 230 vertical metres, initially following the northern bank of the river which it crosses on a pipe bridge to the southern bank before entering the Coedydd Aber Forest. 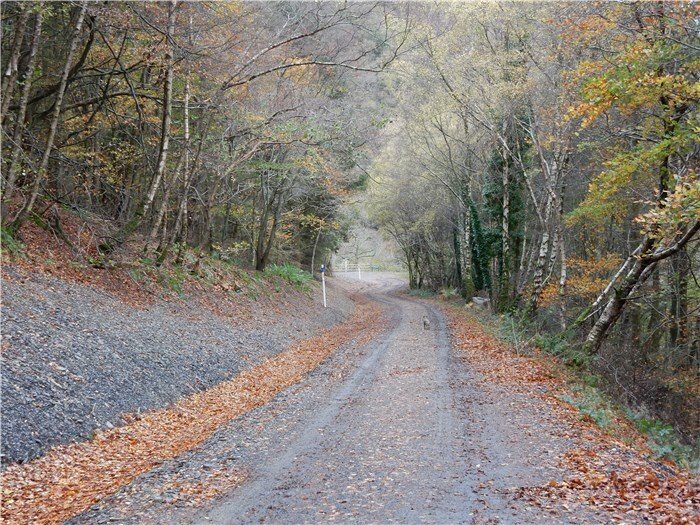 Here, it follows the forest track down to the turbine house located just inside the entrance to the Aber Falls National Nature Reserve. 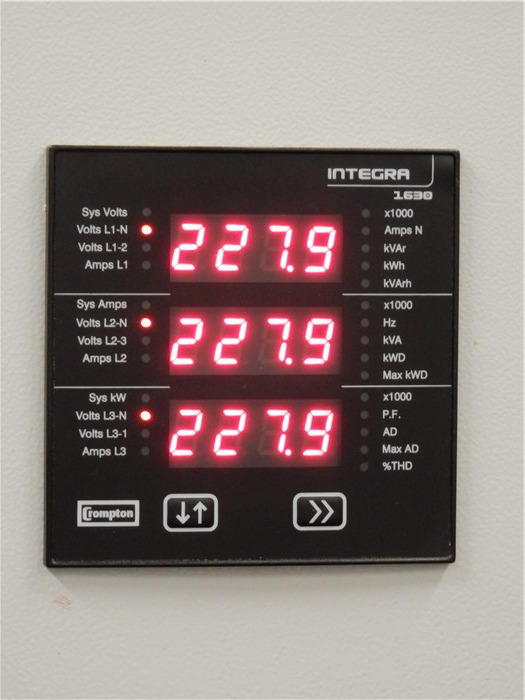 The maximum power output is 270 KW but output is subject to variation in proportion to the flow of water in the river. 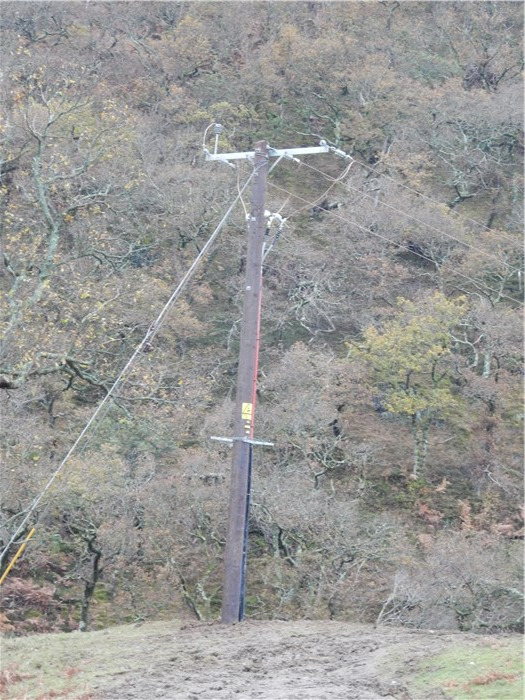 Power produced by the turbine is exported to the National Grid via a new line to existing power lines approximately 150 m from the turbine house. 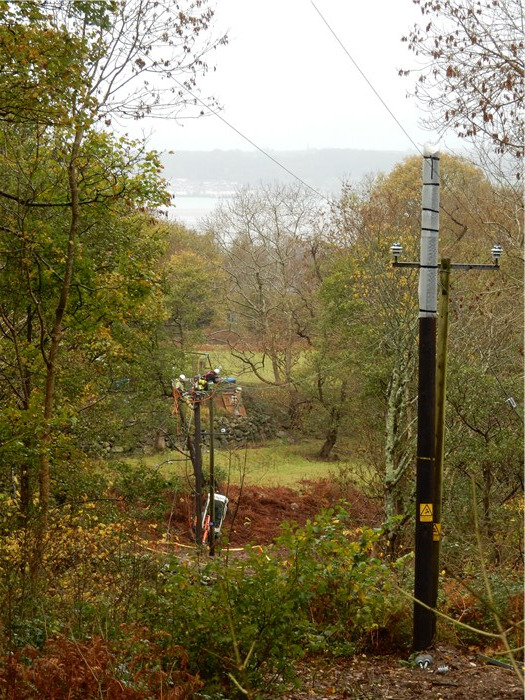 This required an upgrade of the existing lines from the substation in the village about 1 km below the connection point. 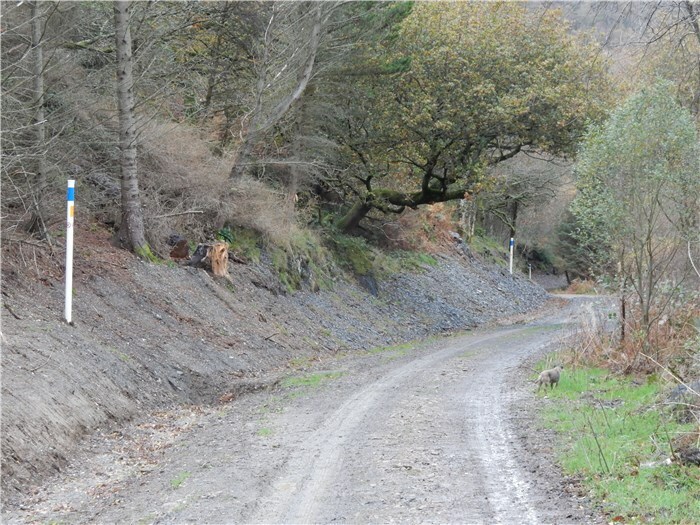 A full feasibility study was conducted by John Howarth (John Howarth Hydropower Services), Dr Rod Gritten (Gritten Ecology) and subcontracted specialists. 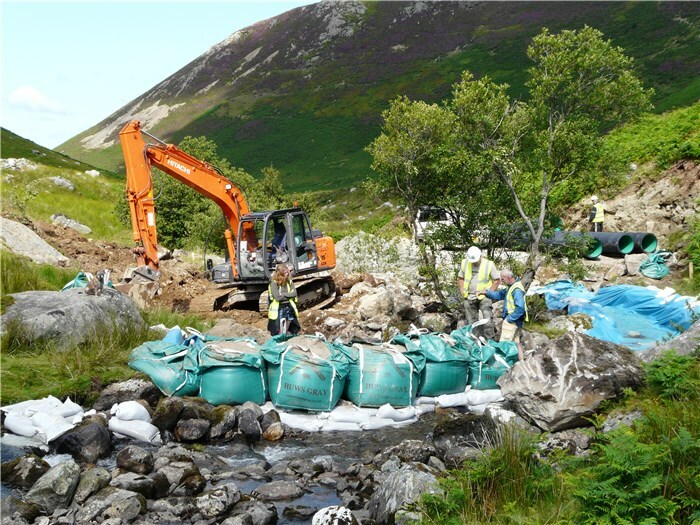 The resulting Environmental Statement was the basis for applications to Natural Resources Wales (NRW) for abstraction and impoundment licences and to the Snowdonia National Park Planning Authority. 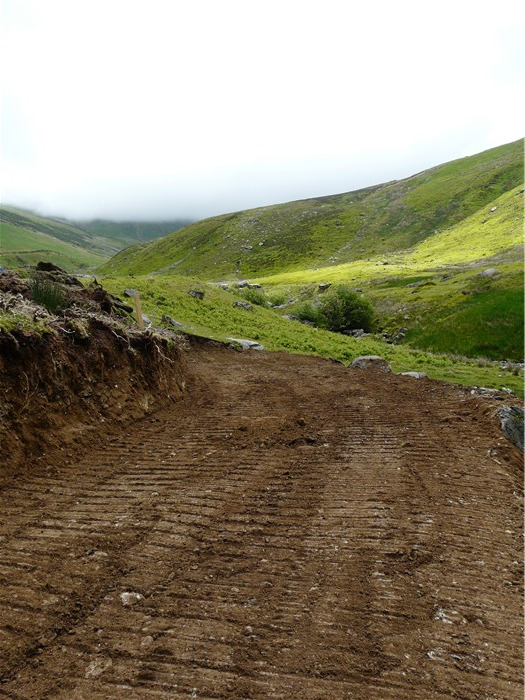 Planning consent was received in December 2013 and the Abstraction and Impoundment licences were issued in July 2014. 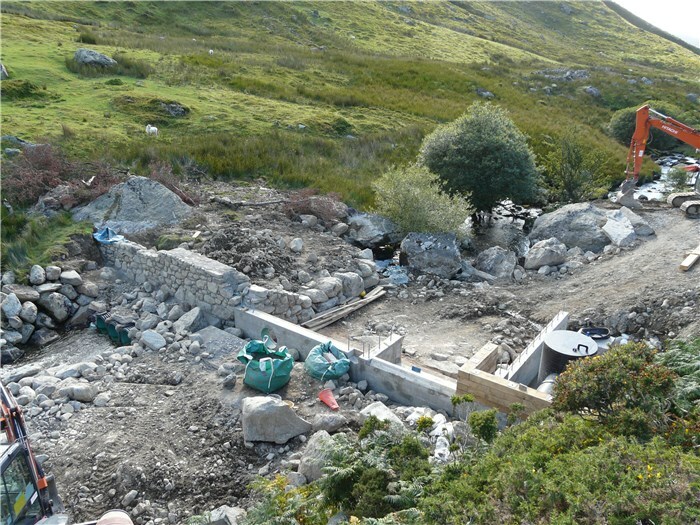 Initial project development costs, including feasibility studies, planning consent application, application for water abstraction and impoundment licences, advice on administrative structures, legal fees, cessation agreement for grid connection, etc., were covered by grants, resources and support provided by Ynni’r Fro, Abergwyngregyn Regeneration Company, the Cooperative Community Energy Challenge, the National Trust, Gwynedd Werdd, the Waterloo Foundation, Wales Cooperative Centre, the Cooperative Enterprise Hub and Cooperatives UK. 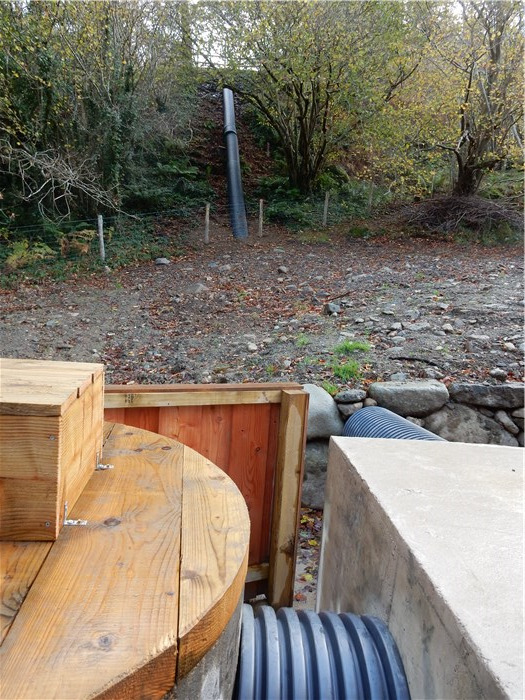 In the event, the Anafon Hydro was constructed for a total of £1.1 M, almost exactly in line with John Howarth’s estimate. The capital funding for the project came from two sources. On September 13th 2014, Ynni Anafon Energy launched a community share issue which attracted investment of £450,900 by its closure in March 2015, with the majority of shareholders living locally but with others from across the UK and abroad. Additional funds were raised through a bank loan of £545,000 from Charity Bank, repayable over 15 years. 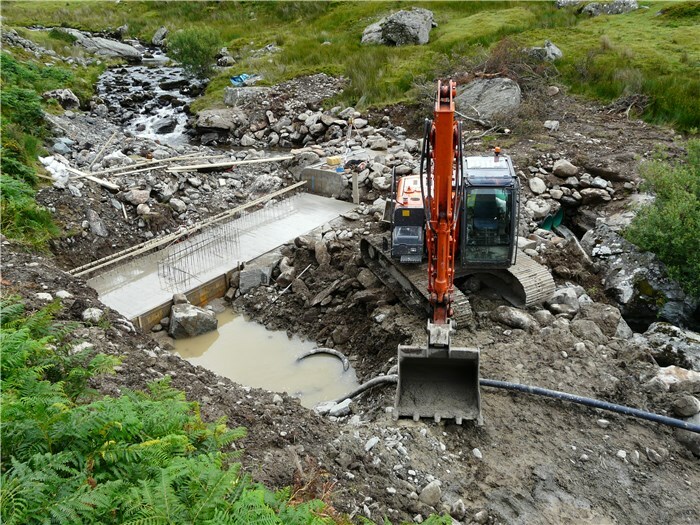 Following a tendering process in 2014, two contractors were engaged to build the hydro: Gelli Civil Engineering to build the turbine house and the weir and Kevin Williams Earthworks to install the pipeline. 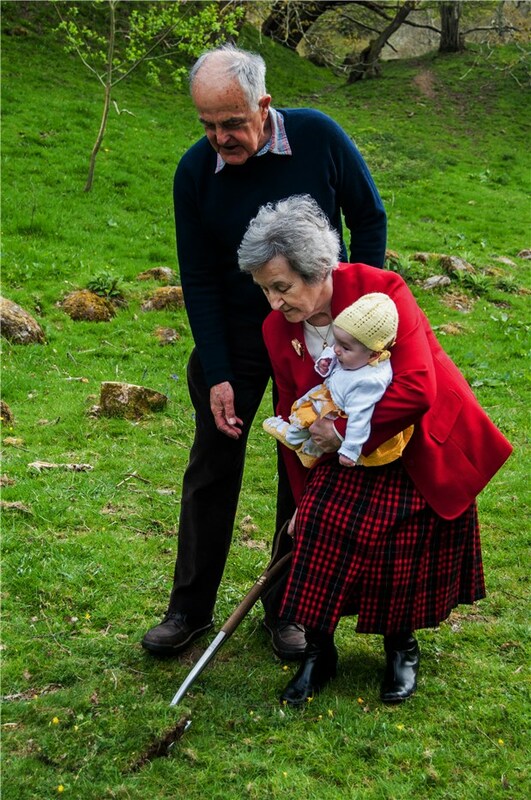 After a village ceremony on 4 May 2015 at which the oldest and youngest residents born in Abergwyngregyn together cut the first turf, Gelli arrived on site on 5 May to commence work on the turbine house. 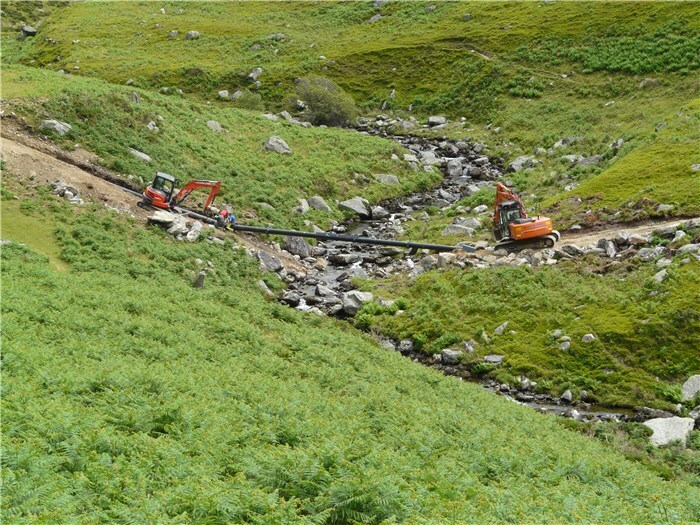 Kevin Williams started work on the pipeline in the Anafon valley on 11 May. Construction proceeded smoothly and both contractors finished work at the end of September 2015. 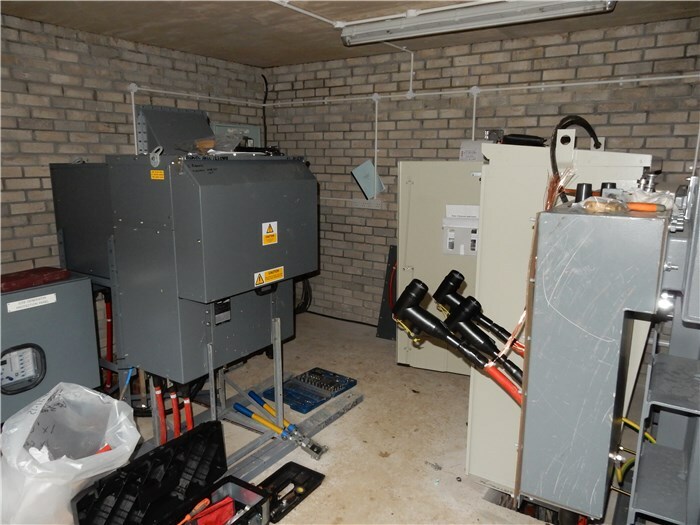 However, Scottish Power failed to schedule the work to install their substation in the turbine house and to upgrade the power lines from the village to coincide with the completion of construction. 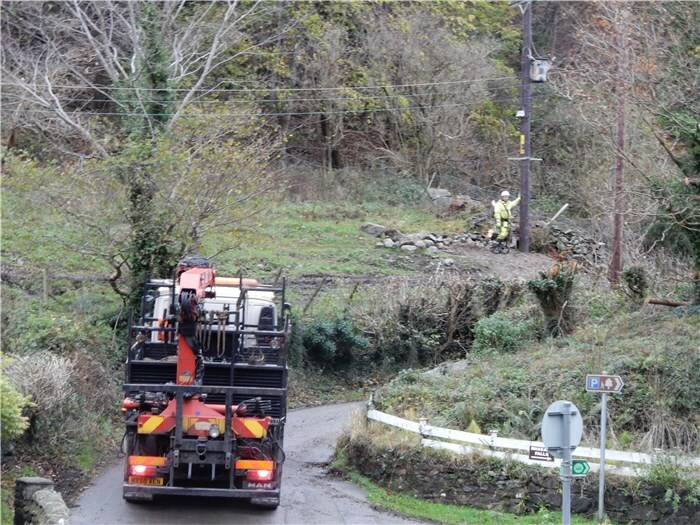 They commenced work on the substation in the middle of November but the work on the power line upgrade did not start until towards the end of that month by which time the weather had broken causing further delays. 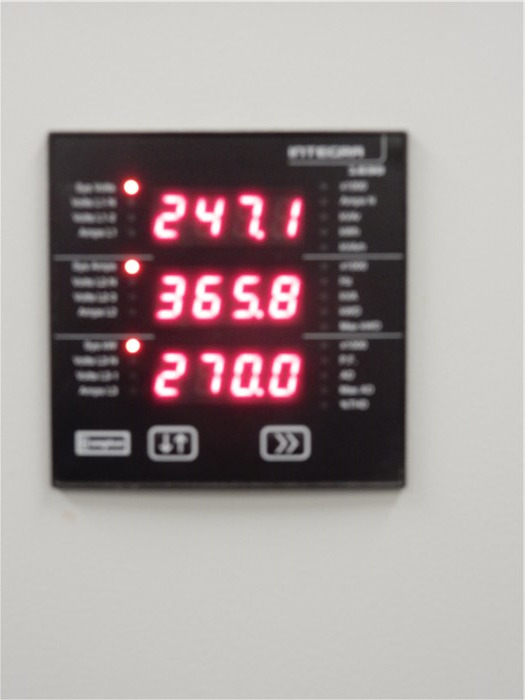 The upgrade and connection to the grid were eventually completed on 27 November 2015 and work to commission the plant started immediately. 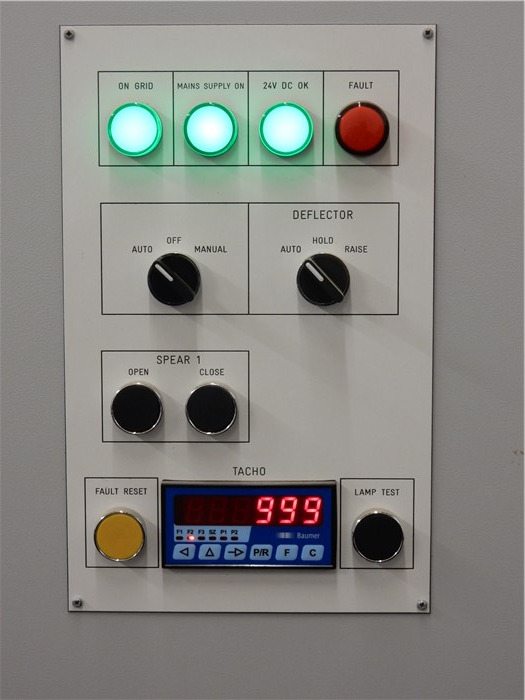 Commissioning was completed on 30 November with the successful completion of the G59 test and the Anafon Hydro commenced full generation and export of electricity to the grid on 1 December, one month earlier than our original target date. 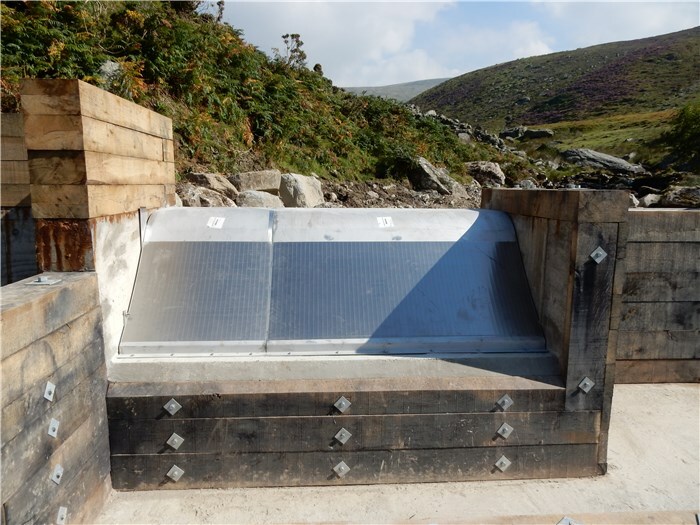 For the first 20 years, our financial projections indicate that the Anafon Hydro will generate gross revenue of approximately £200,000 a year, made up from the sale of electricity and the Government subsidy to renewable energy generation, the Feed-in-Tariff. Thereafter, the income will be derived solely from the sale of electricity except in the unlikely event that there are further government subsidies. After servicing our bank loan and the deduction of running costs, profits that are generated during the first two years of operation will be allocated to building up a number of reserves in accordance with the conditions of our bank loan and to cover emergencies. From the third year, YAE will commence payment of interest to our shareholders and disposable profits will be transferred to the charity, Dŵr Anafon, for distribution for community benefit. For the first 15 years until our bank loan is paid off, we expect these disposable profits to be in the region of £30,000 to £40,000 p.a. From Year 16 to Year 20 when our Feed in Tariff ends, this figure should rise to in the region of £80,000 to £90,000. 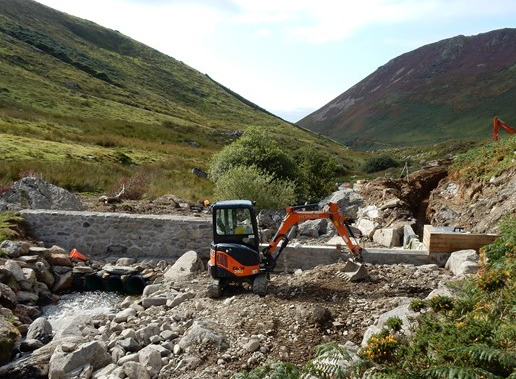 However, during this period, we are committed, under the terms of our lease, to make a donation of £25,000 p. a. to the National Trust specifically for conservation work in the Carneddau massif in which the hydro is located. The amount available for local community benefit will therefore rise to approximately £55,000 to £65,000. After Year 20 when the Feed in Tariff ends, income will depend on the price of electricity which cannot be predicted. 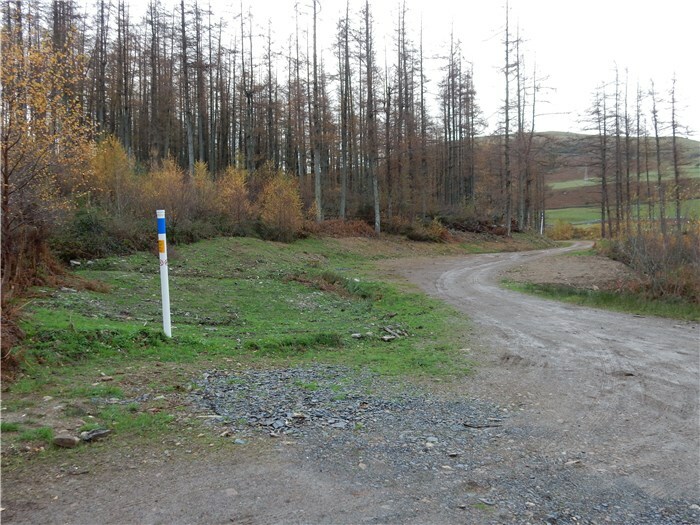 Preparatory work on site will start on 3 March 2015. 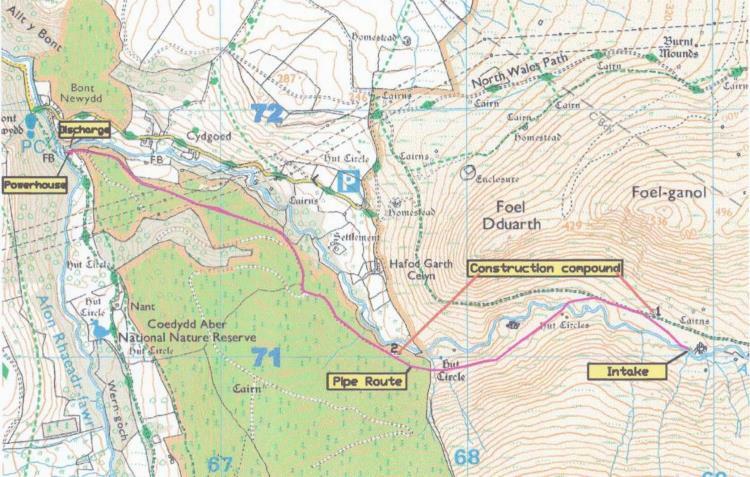 This will include felling a number of mature conifers in the Aber Forest to create a 100 m long corridor for the pipeline as it enters the forest. The work is expected to take about 3 weeks. 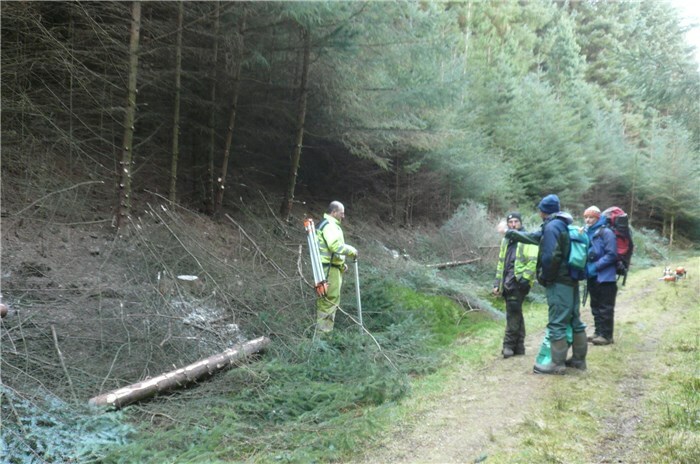 Paul Smith (Alfa Tree Services) and his team start work clearing the corridor. Paul discusses the work with Kevin Williams, pipeline contractor, John Howarth, project engineer, and Dr Rod Gritten. ecological clerk of works. 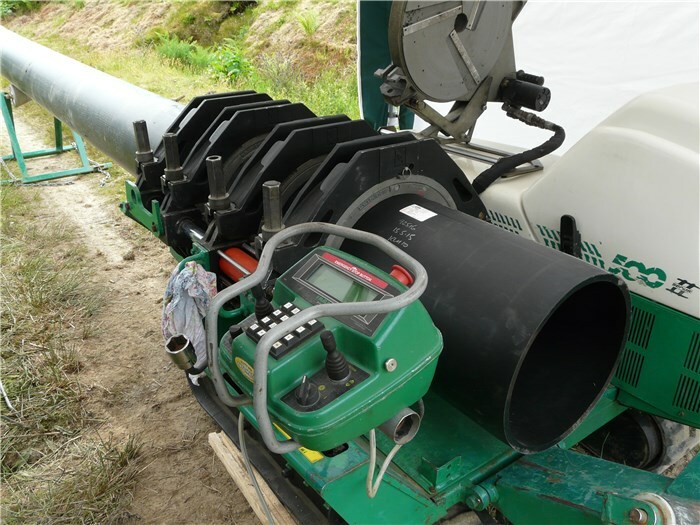 Final survey of the pipeline route. 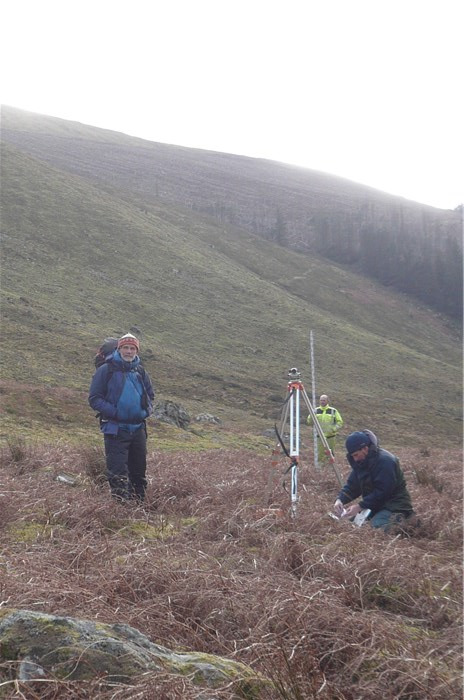 Dr Rod Gritten, Kevin Williams, and John Howarth conduct a final survey of the pipeline route through the heath in the Anafon Valley, a particulary sensitive section. As a reesult of this survey, minor changes were made to the route. 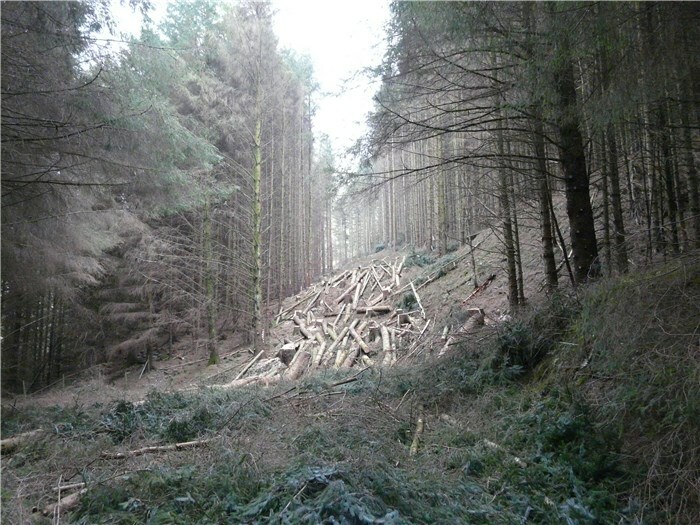 Alfa Trees Services completed felling the 100m section of the pipeline route through mature Sitka Spruce into Coedydd Aber forest on 17 March 2015, 3 days ahead of schedule. 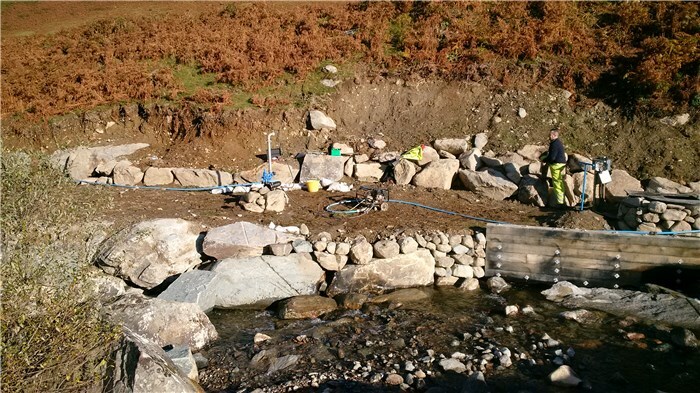 Derwent Hydro engineers carry out an independent technical assessment of the Anafon Project for Charity Bank, our probably main lender. 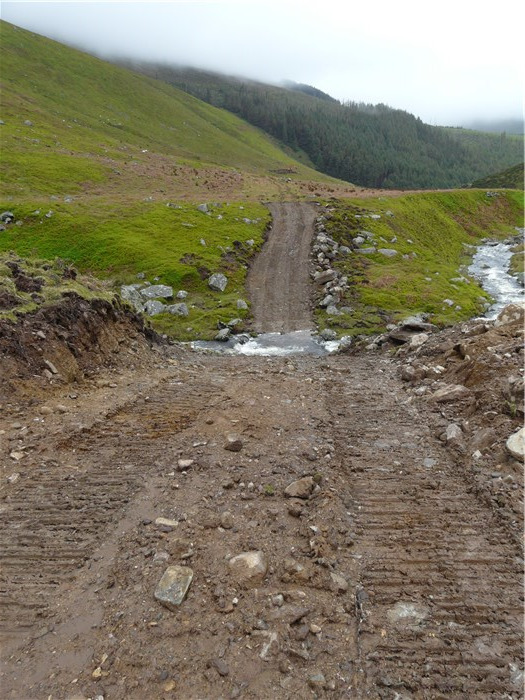 Following the tendering process, the Board will be awarding the contracts to build the Anafon Hydro to two contractors. 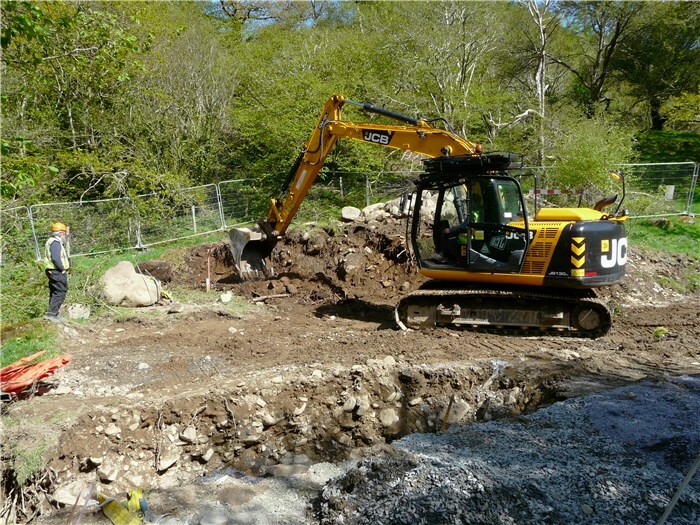 Gelli Civil Engineering, Tremadog, will build the weir and turbine house and Kevin Williams Earthworks, Bontddu near Dolgellau, will install the pipeline. 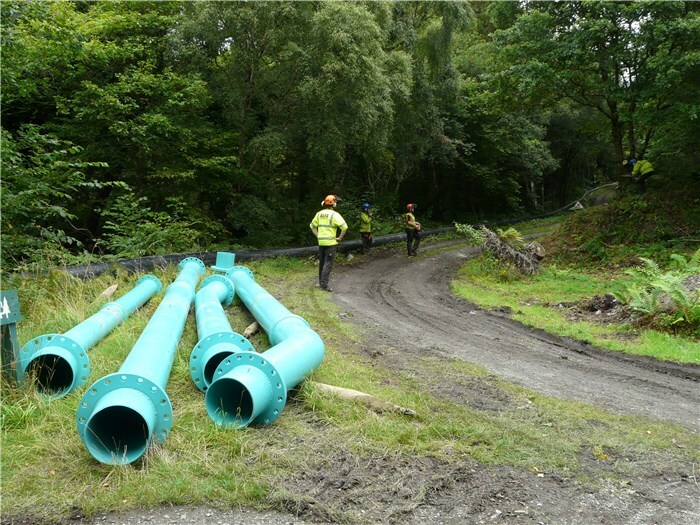 Gelli Civil Engineering have wide experience of civil engineering work near and in rivers and Kevin Williams installed the pipeline for the Harnog Hydro and so is experienced in pipeline installation and reinstatement work in sensitive environments. Both contractors expect to start work in early May. 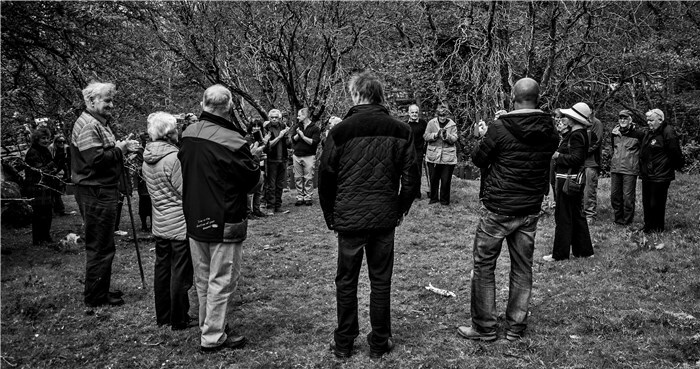 The Abergwyngregyn community gathers at the turbine house site for the ceremony to cut the first turf - 4 May. Eirlys Williams and Emily Jones (4 months old), the oldest and youngest current residents born in Aber, cut the first turf. 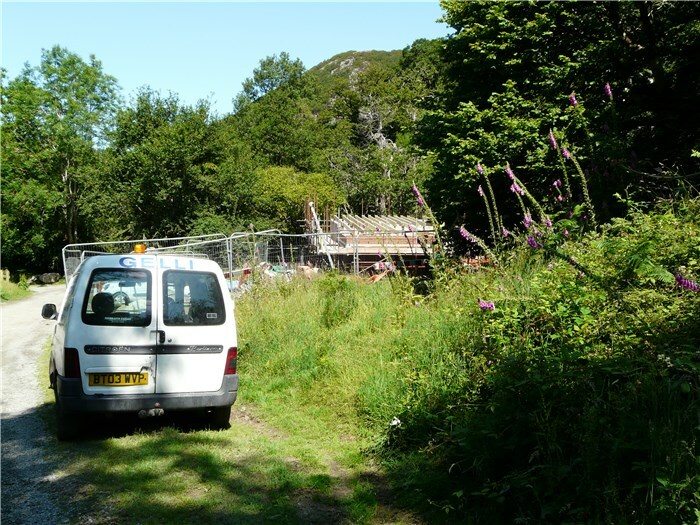 The turbine house and weir contractors, Gelli Civil Engineering, arrive at the turbine house site - 5 May. 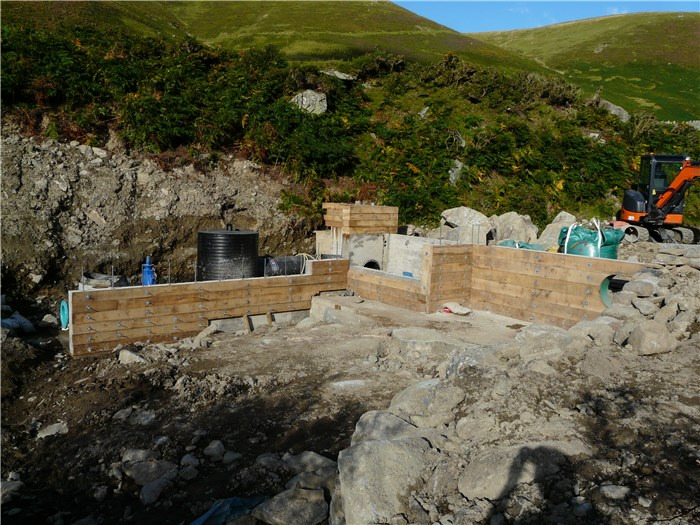 The site cabins go in. 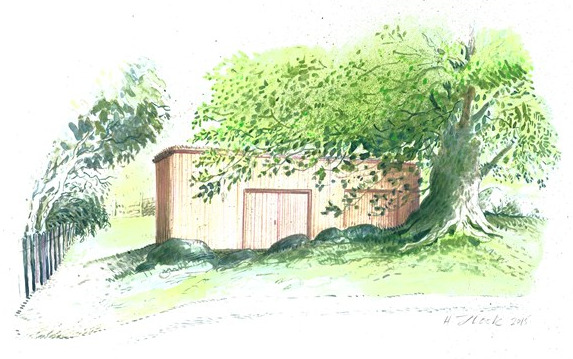 Artist's impressions of how the turbne house will look by Aber resident, Helen Flook. 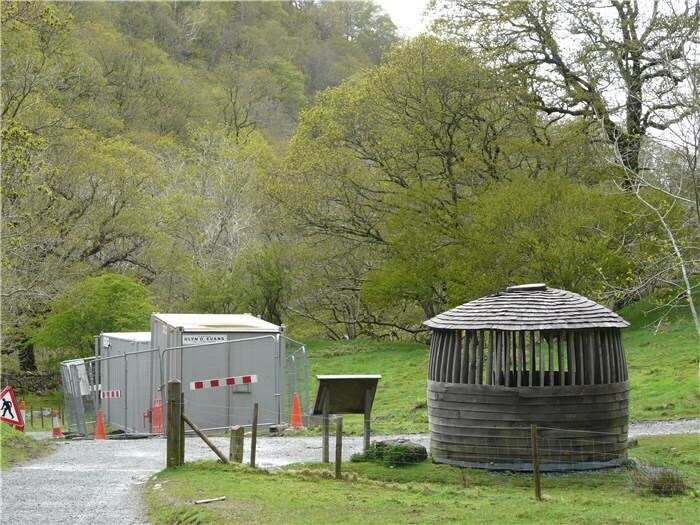 The turbine house from the gate into the Aber Falls reserve. 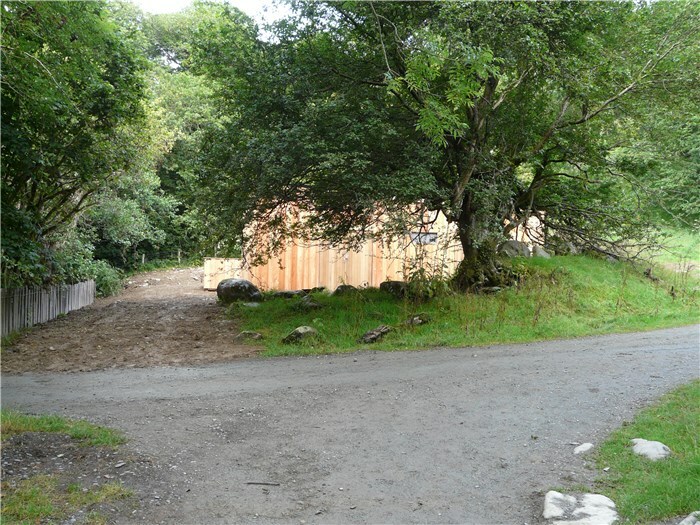 The view of the turbine house as you return from the Falls along the main footpath. 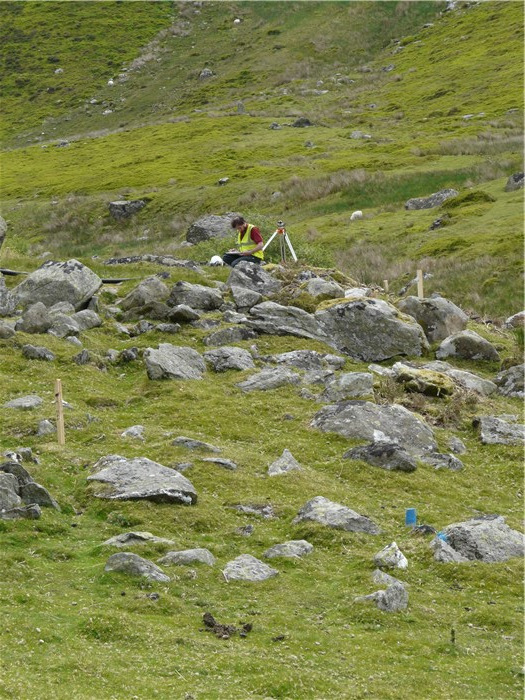 Excavation for the Turbine House continues under the watchful eye of archaeologist, Ian Brooks, carrying out his watching brief. The only finds so far: two Northern Dairies milk bottles! 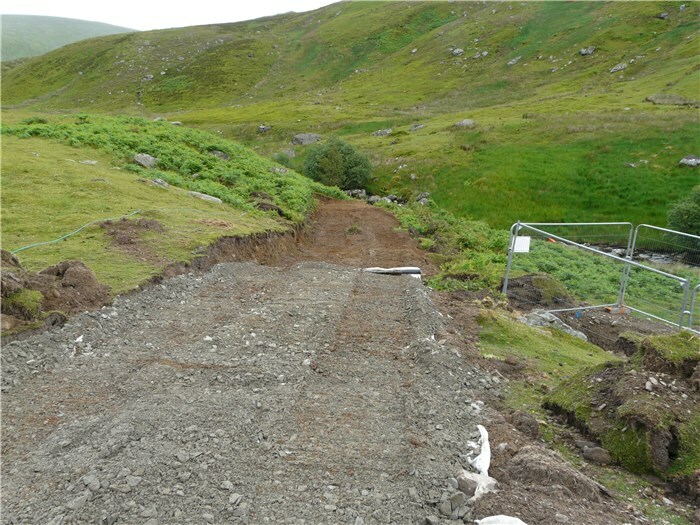 Excavation for the foundations of the turbine base is complete. 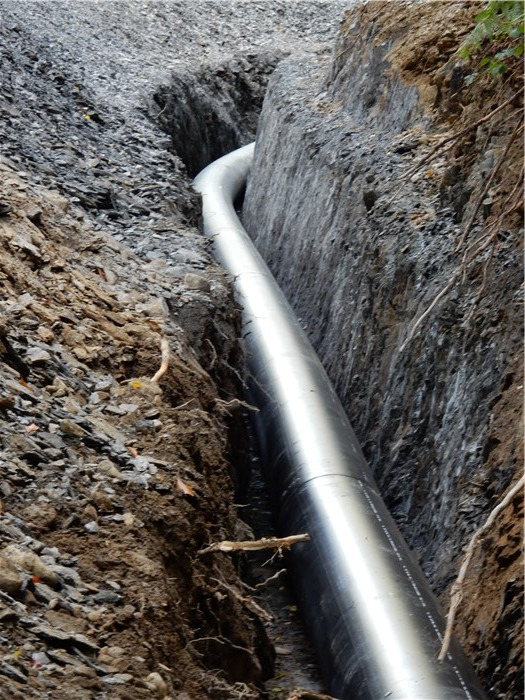 The outflow pipe from the turbine is installed. 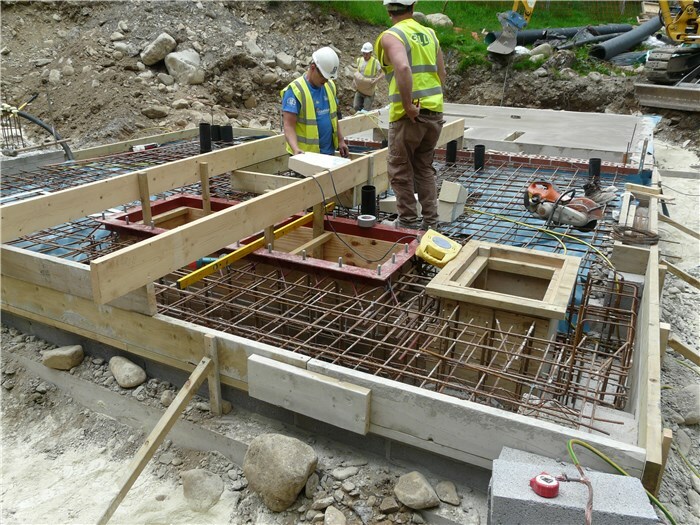 Shuttering for the foundations of the turbine base and the first concrete is poured. Excavation for the sub-station foundations. 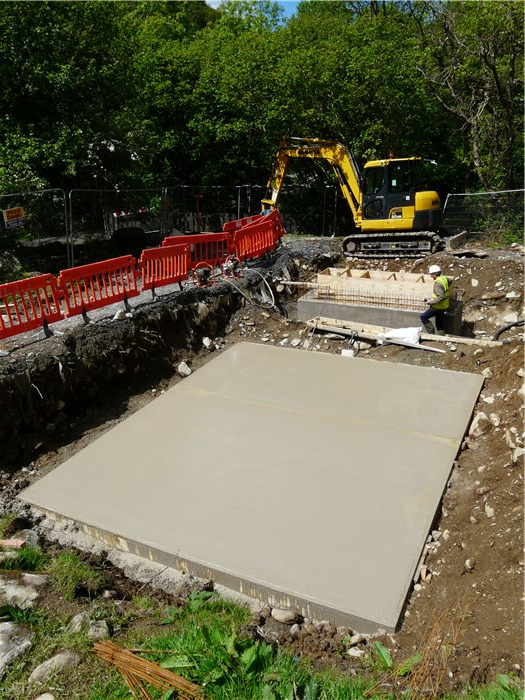 The sub-station floor is cast. 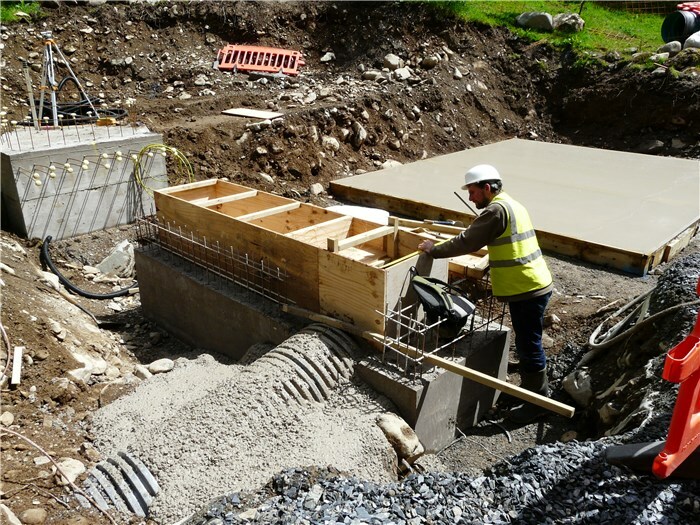 John Howarth inspects the foundations. 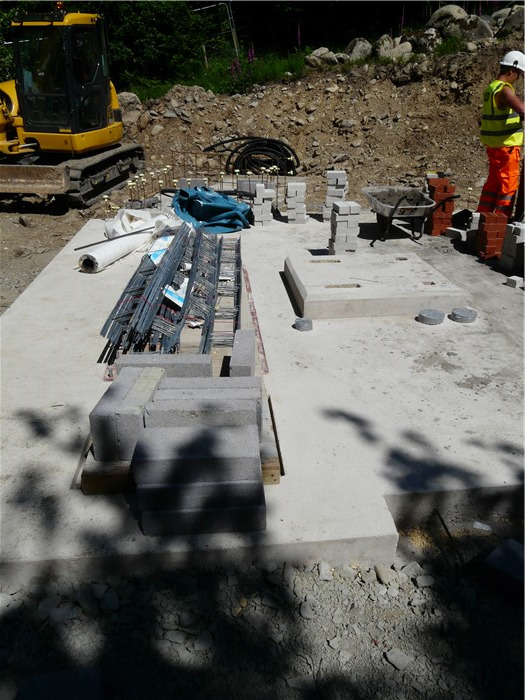 The brickwork for the sub-station underfloor cable ducts is completed - 8 June. 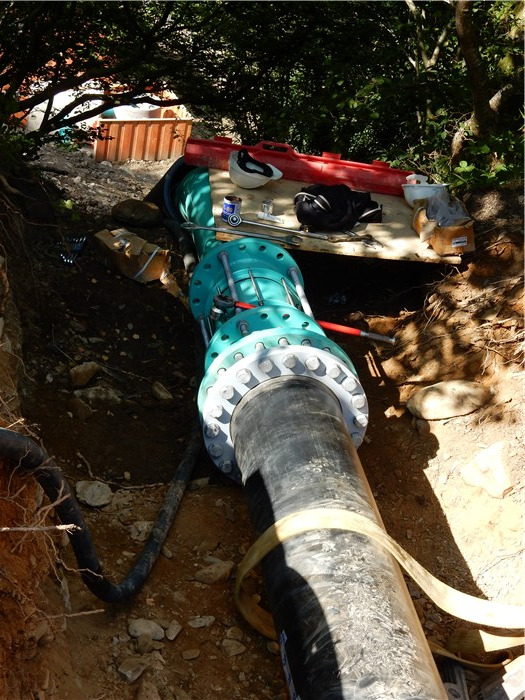 In the meantime, Kevin Williams, our pipeline contractor, has been busy on the pipeline in the Anafon Valley. 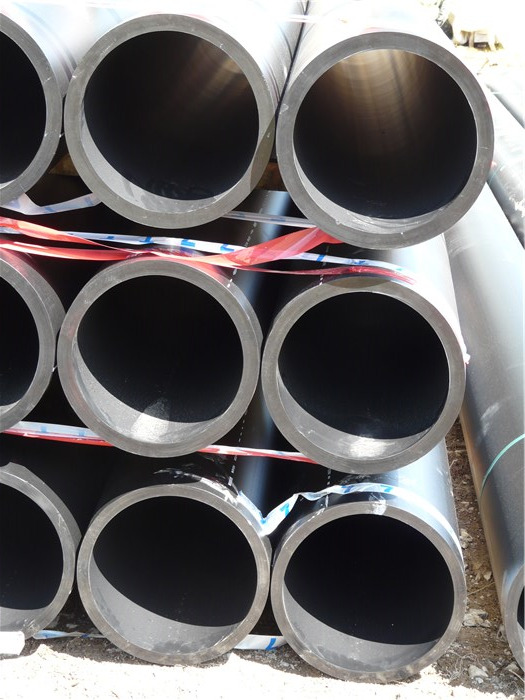 Ten metre sections of the polyethylene pipe are welded together to form 130m lengths ready for installation. The welding machine in action. A temporary track is put in across the river. 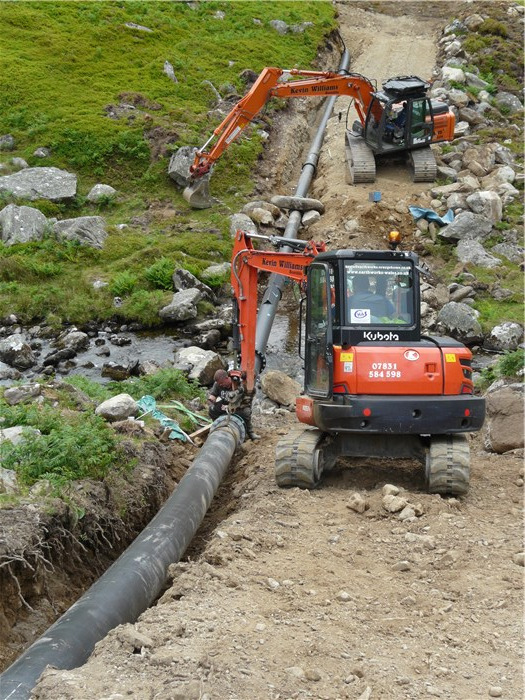 Work starts on the installation of the pipeline on the mountain - 2 June. 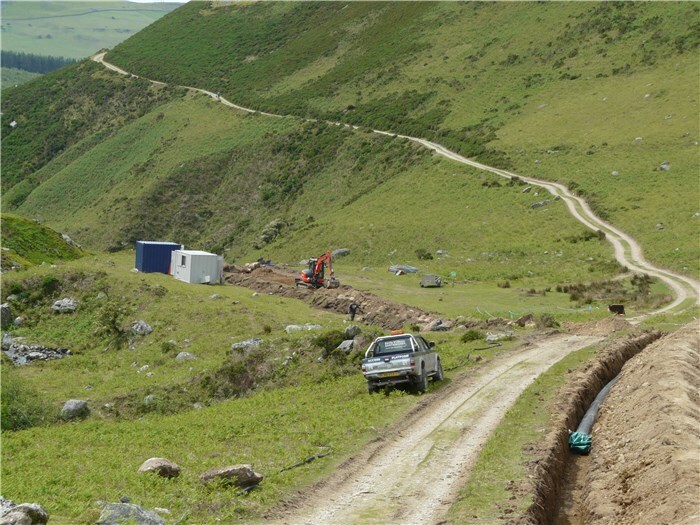 The trench for the first 130m length of pipe is opened - 3 June. and drawn into its trench. 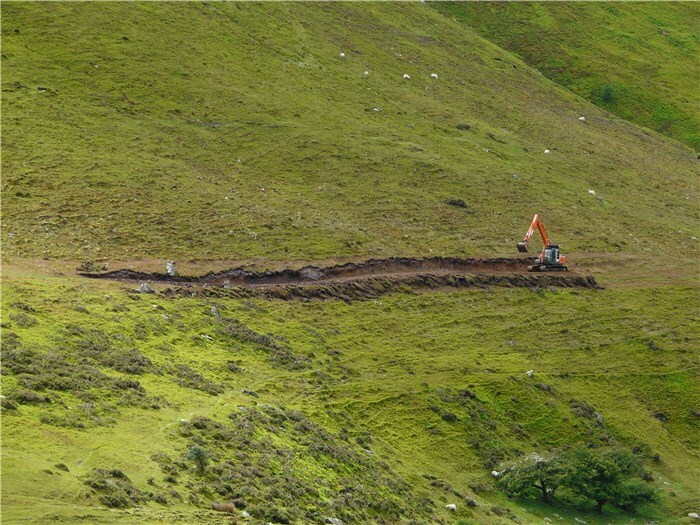 The first section in position in its trench. 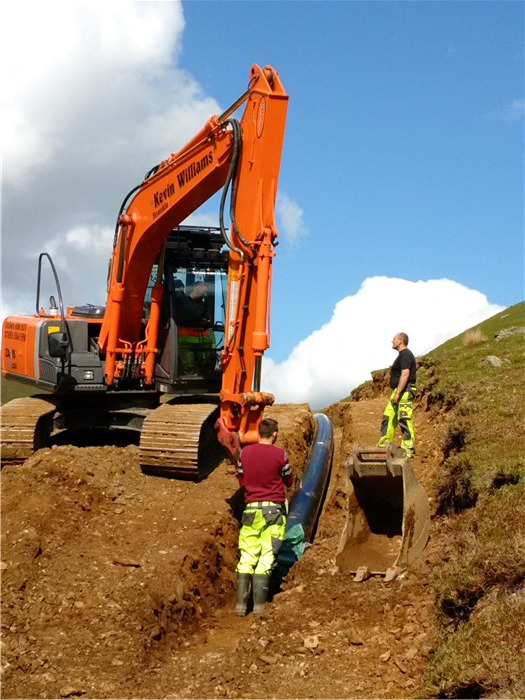 The trench for the second 130m section of pipe is opened. The first 2 sections of pipeline are welded together. Adjusting the reinforcement for the turbine house floor. 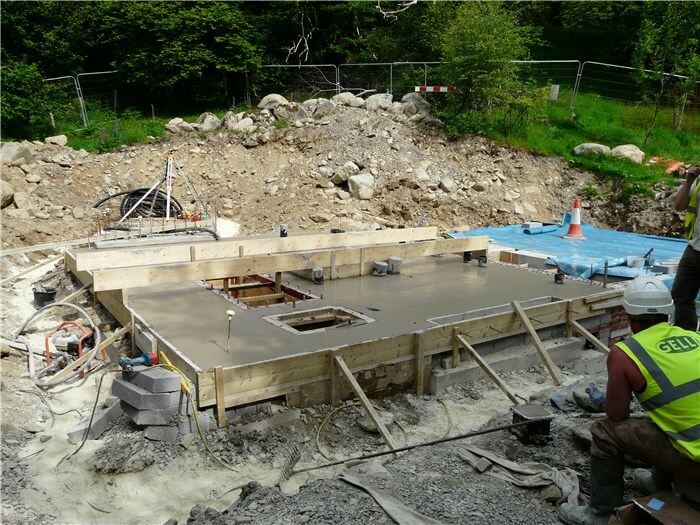 The turbine house floor is cast. 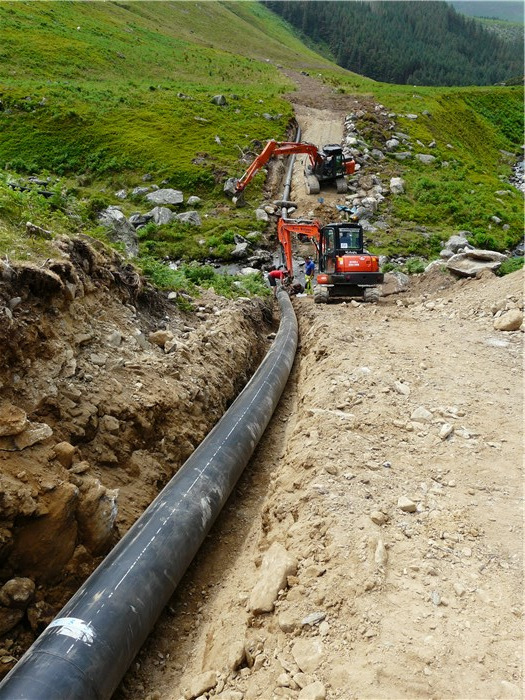 The first 400m of the pipeline is installed on the southern bank of the Anafon River. 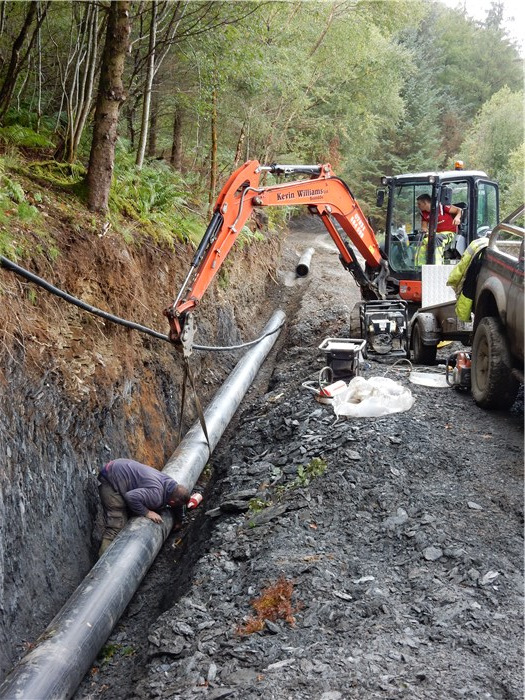 The reinstated pipeline route begins to recover. 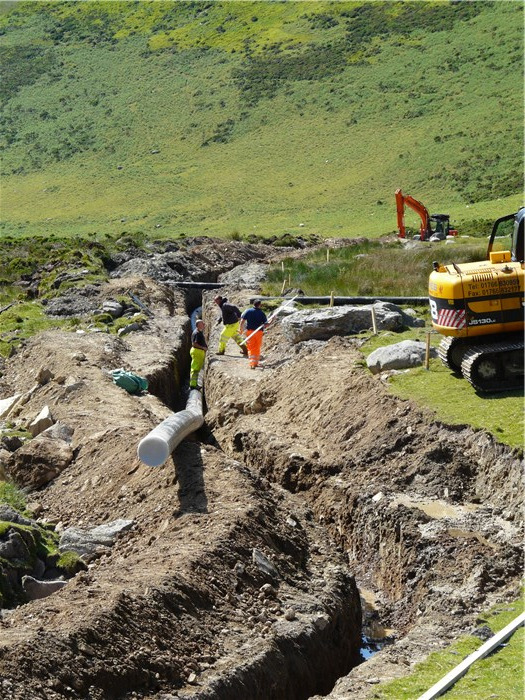 The first section of pipe is installed on the north bank of the Anafon. 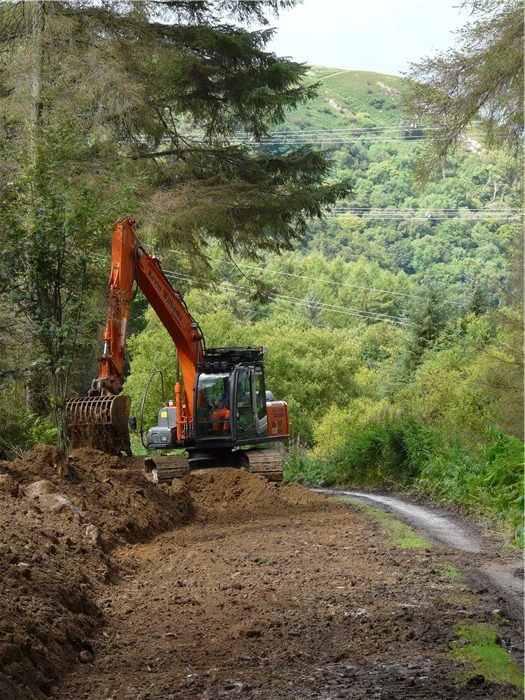 Work begins clearing the corridor through the forest for the pipeline. The walls of the substation almost halfway there. The base for the generator is cast. 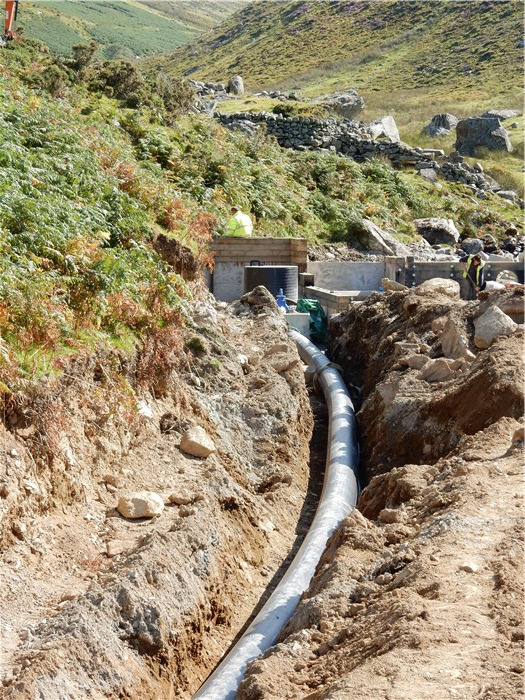 The pipeline on the south bank of the Afon Anafon is installed and the mountainside reinstated. Levels for the pipeline along the initial sections of the pipe below the weir are particularly critical as the drop is only 1 in 165. 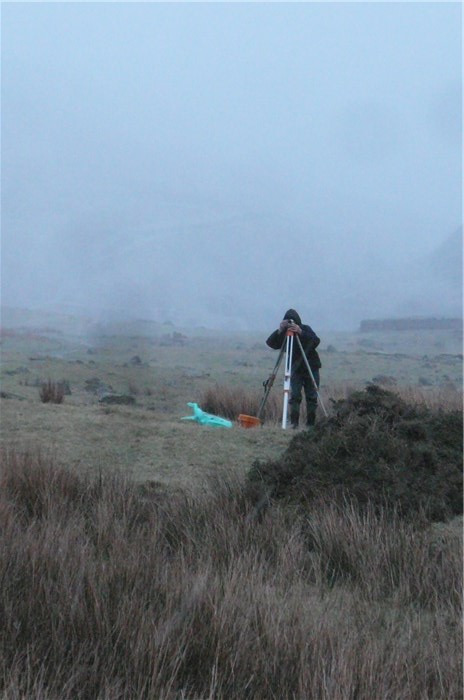 John Howarth makes a final check of the levels. 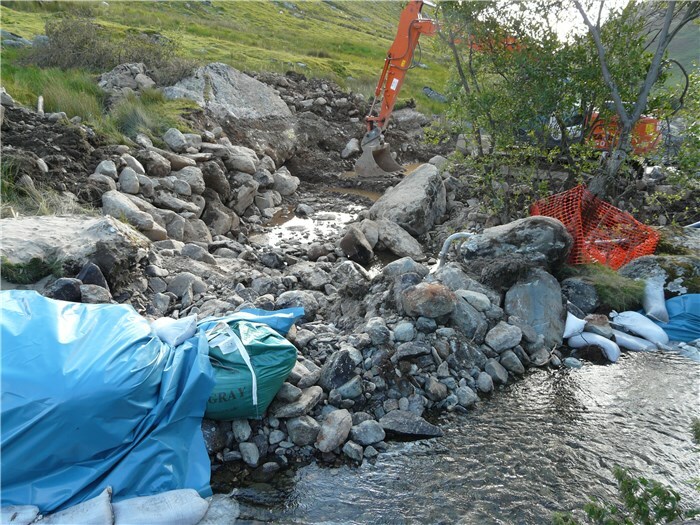 The cut for the pipeline comes within sight of the weir location (by the trees in the background). 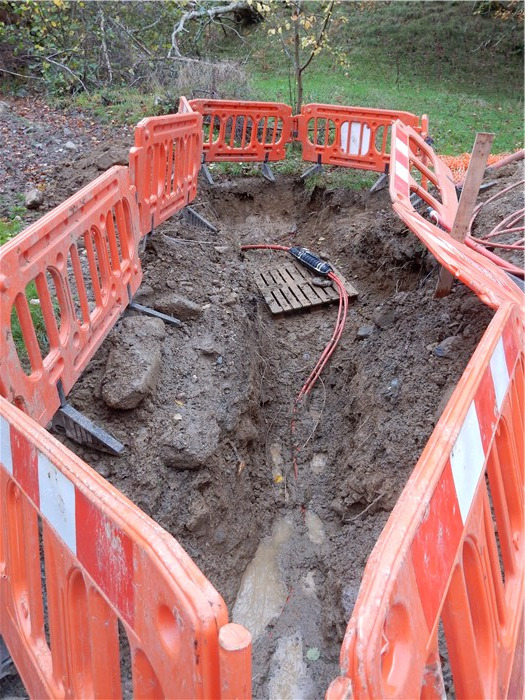 The pipe is eased into its trench. 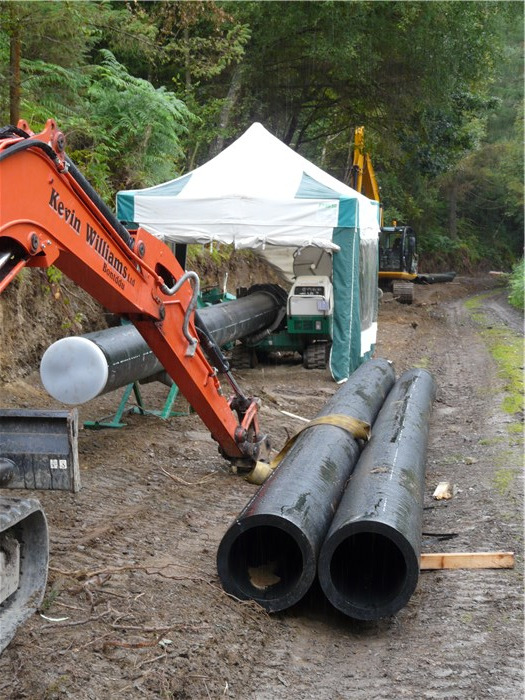 Kevin Williams has only one more short section of polyethylene pipe and the steel pipe crossing the river to install before he moves to the forest. Gelli will install the final section of the pipeline connecting to the weir when this is built. 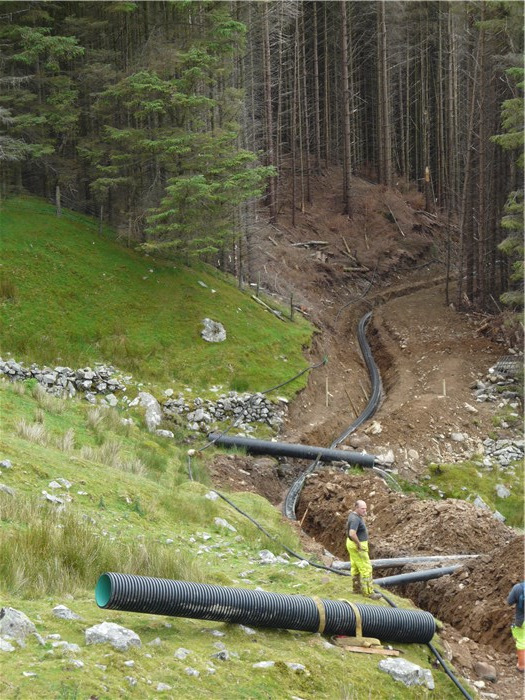 The installation of the pipeline on the north bank of the Anafon nears completion with much of the route reinstated. 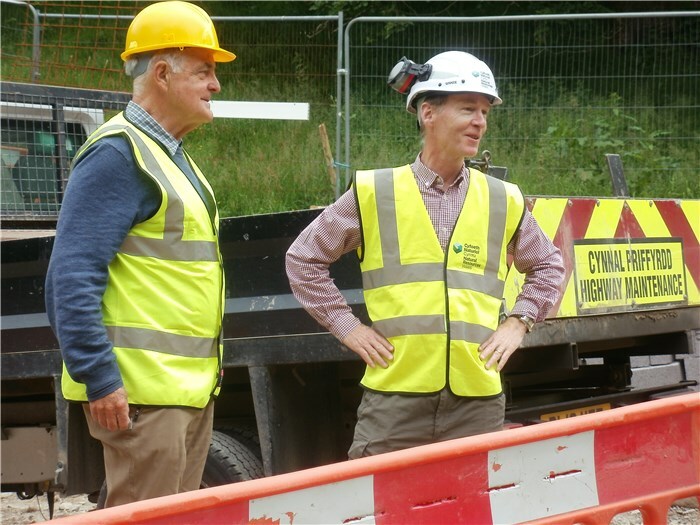 Emyr Roberts, CEO Natural Resources Wales, and Derek Stephen, Energy Deliver Programme Manager, visited the project yesterday. 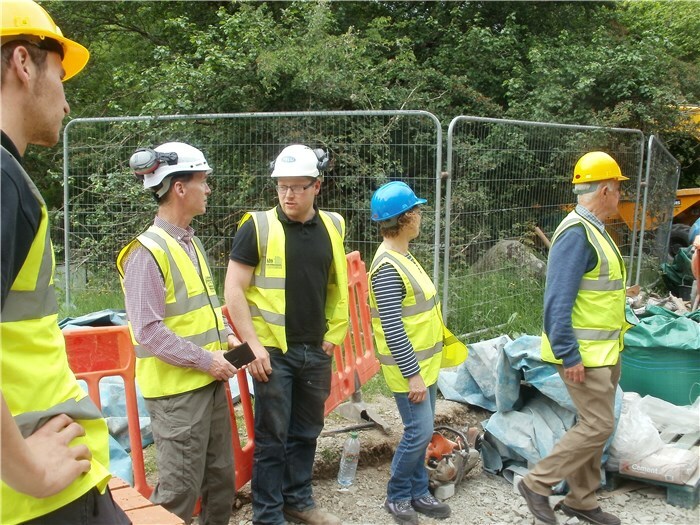 Aeron, Gelli's Site Manager, explains the site to Emyr Roberts. 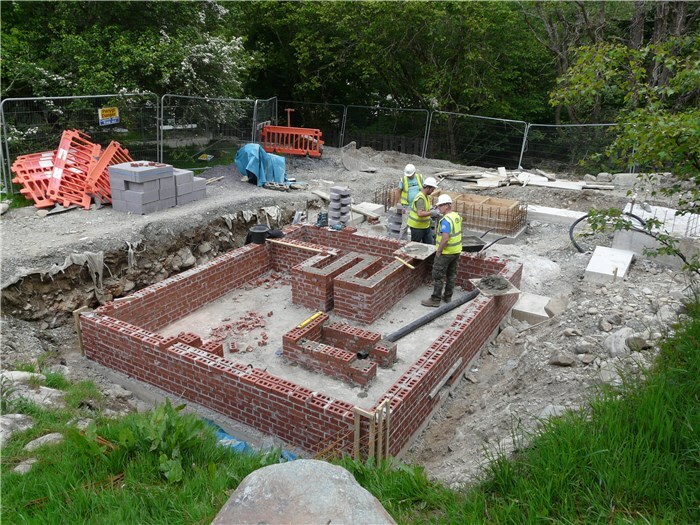 Emyr Roberts and Gavin Gatehouse at the Turbine House site. 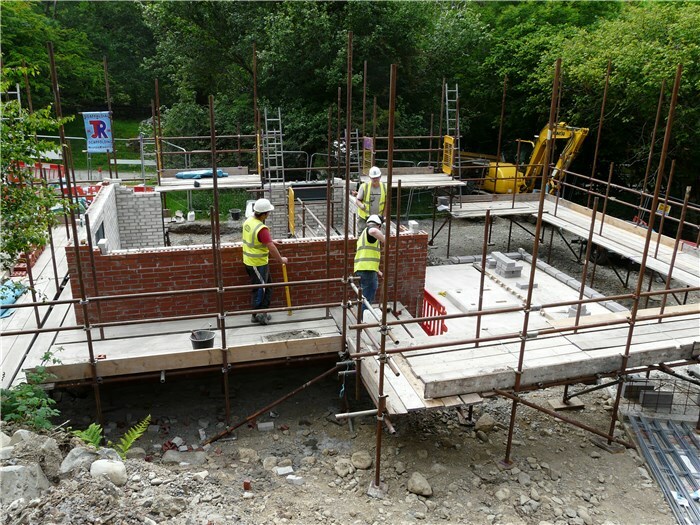 Last few courses of bricks on the turbine house substation. 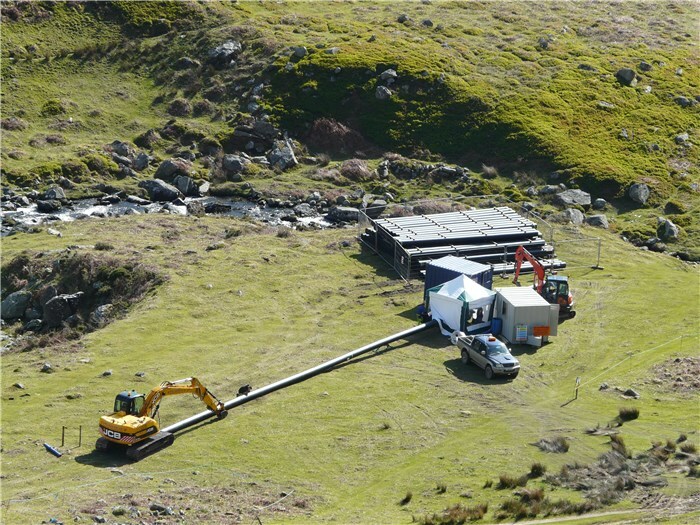 Steel pipe for the river crossing is delivered on site. 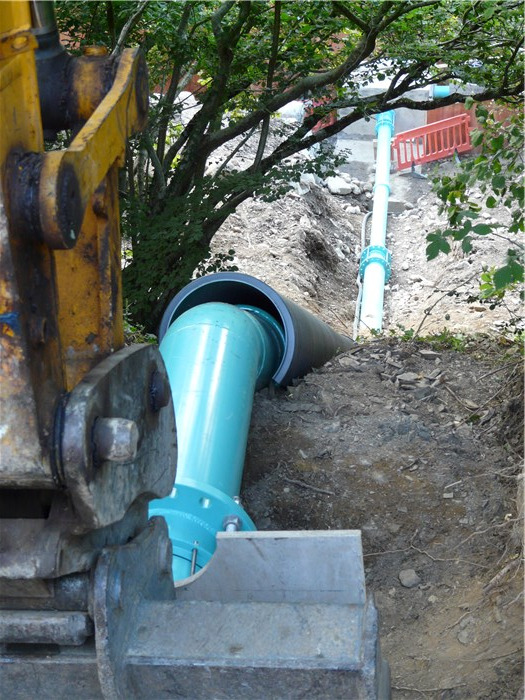 The pipe is positioned across the river. 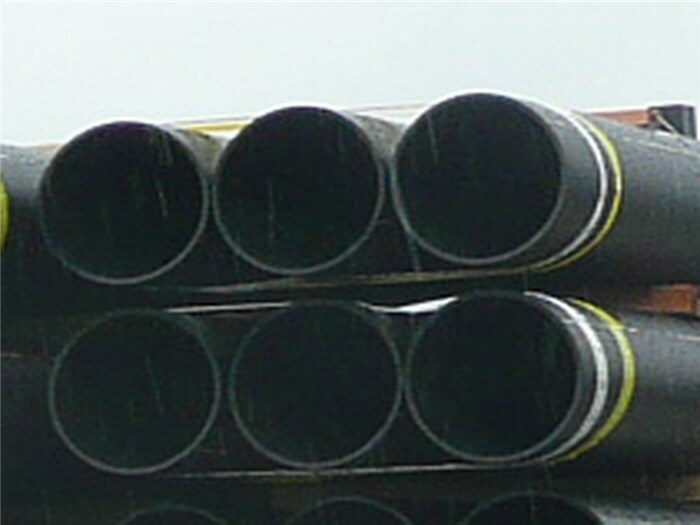 The pipes are aligned for the final connection at the pipe bridge. The connector is bolted up. 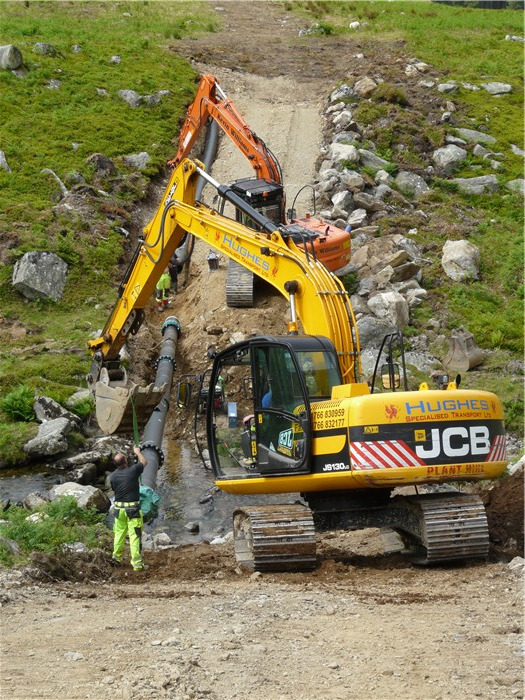 All connections completed on the pipe bridge. 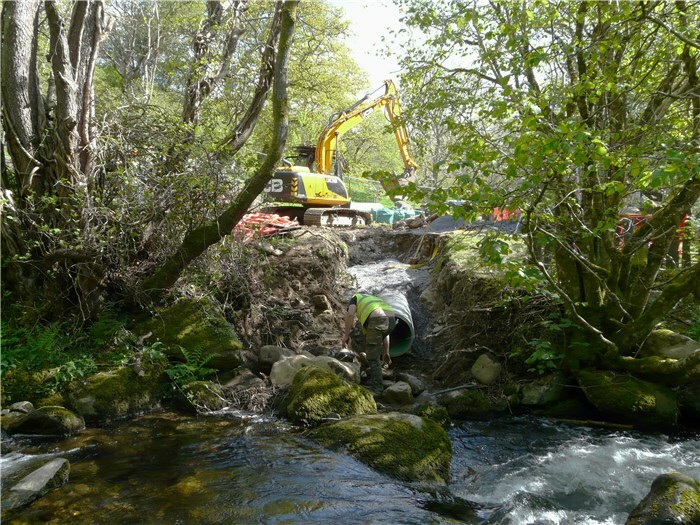 The pipe bridge across Afon Anafon in position. Turbine house substation roof slab is cast. Last few courses of blocks on the turbine room walls. 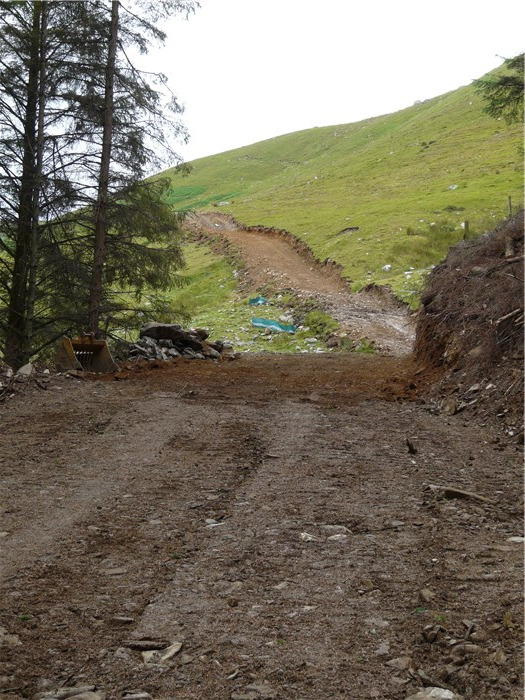 Pipe bridge completed and the surrounding slopes reinstated. 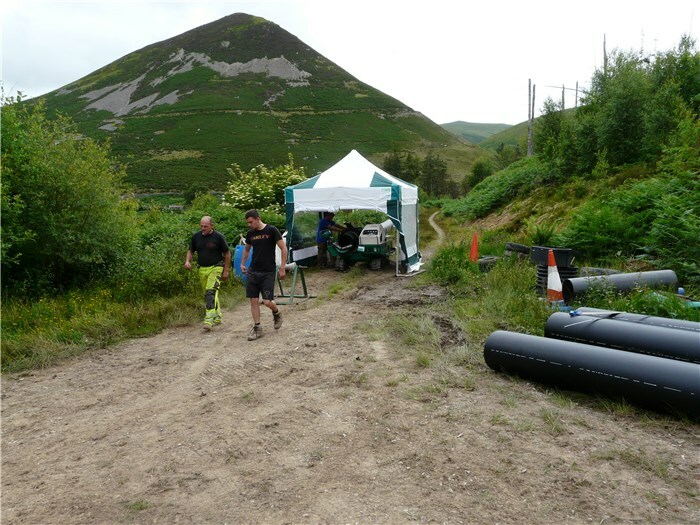 Kevin Williams moves his team down from the mountain and the pipe welding station is set up again. Welding the connector between thinner and thicker walled pipe. The reinstated heath is recovering well after 3 weeks. 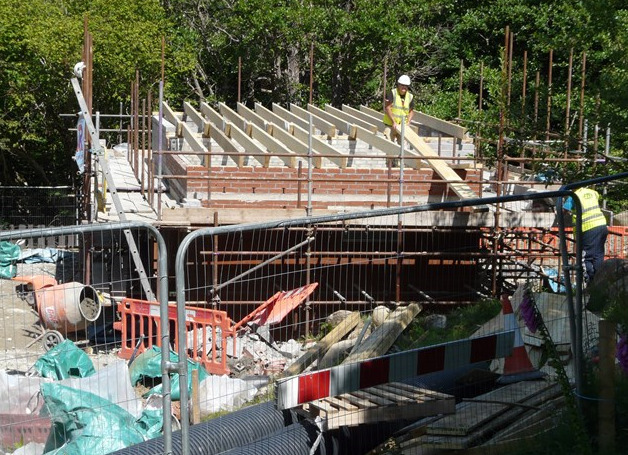 Rafters supporting the sedum (turf) roof of the turbine house are installed. 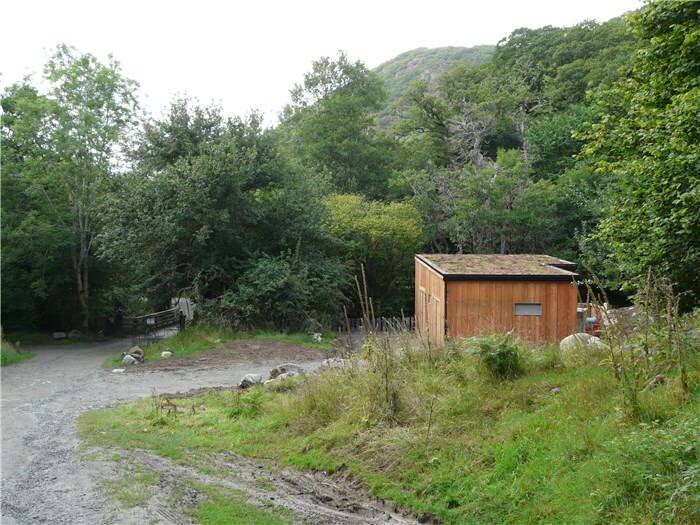 The turbine house comes into view as you return from the Aber Falls. 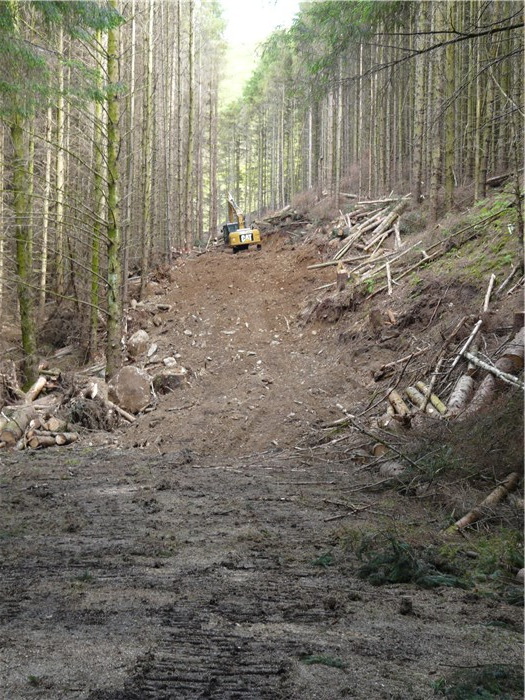 The cutting for the pipeline trench from the forest reaches the end of the pipeline on the mountain. 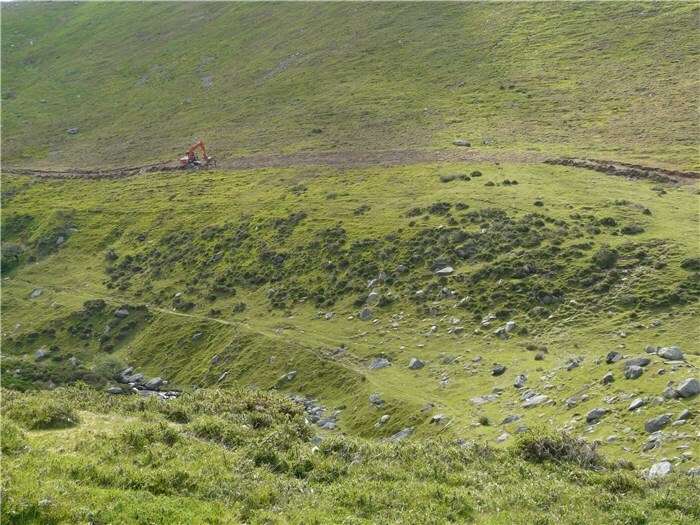 The trench is cut and the pipe dragged up onto the mountain. 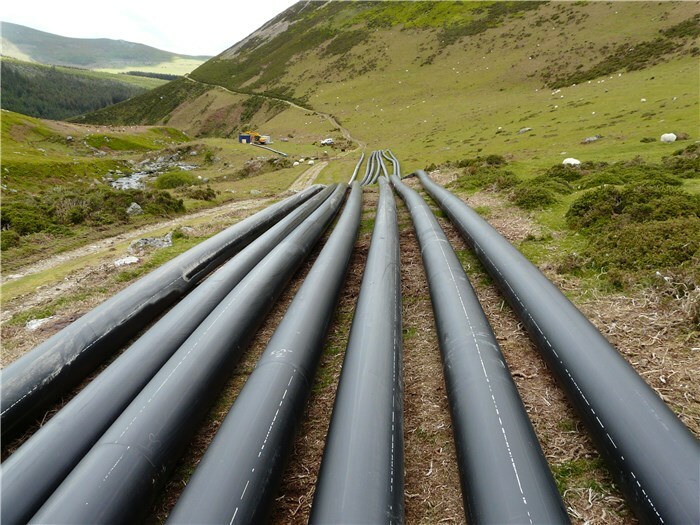 The pipes meet and the connection is made - 9 July. 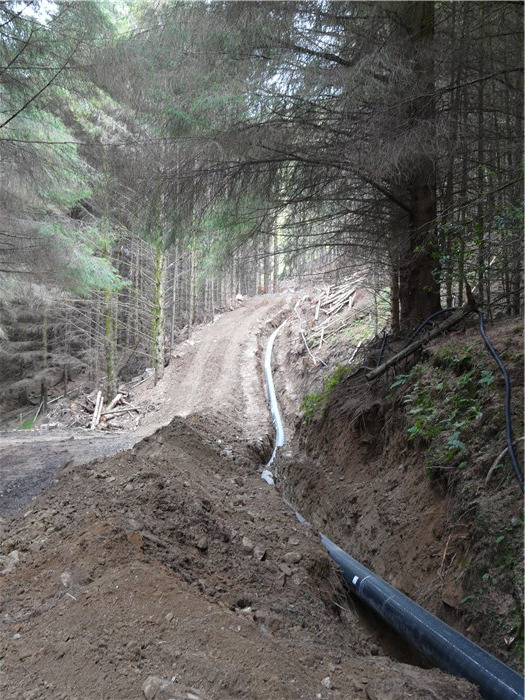 The pipeline reaches the forest track where it will be buried in the uphill bank. 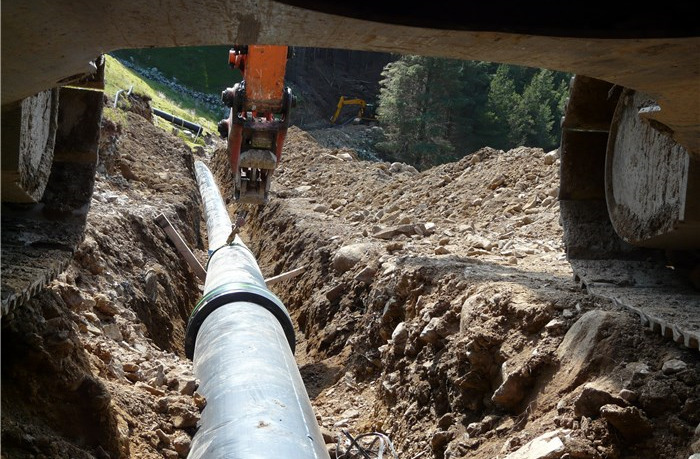 The thin-walled pipe in the upper section of the pipeline is replaced by thicker-walled pipe for the lower sections to withstand the increasing pressure. 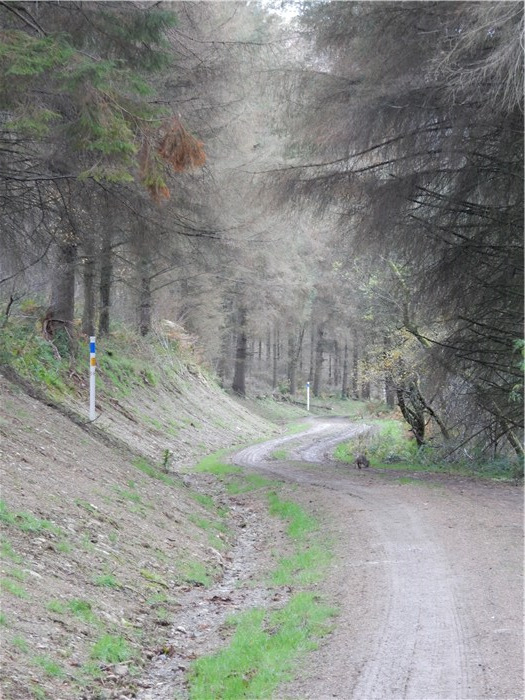 The bank of the forest road is cleared ready for installation of the pipeline. 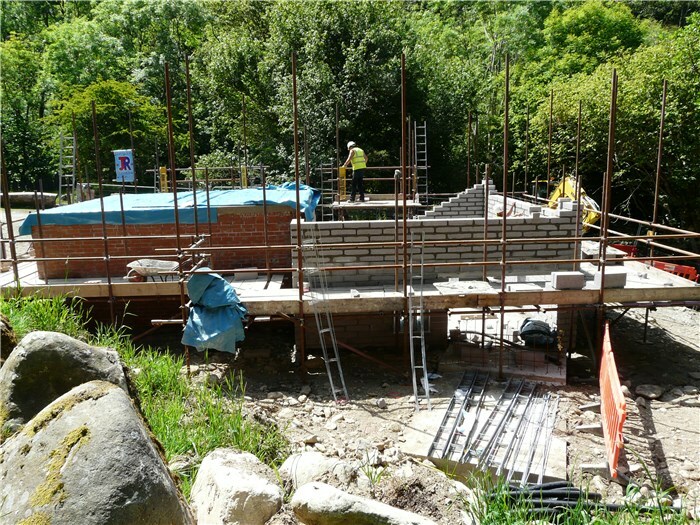 and reaches the site of the weir. 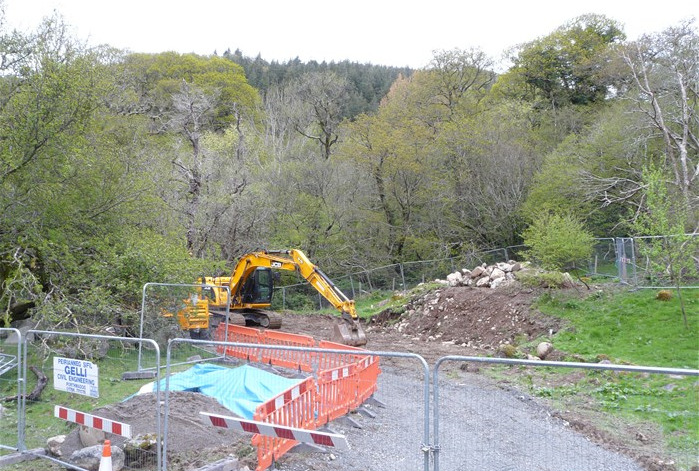 The first channel to divert the river to the north bank is opened up. 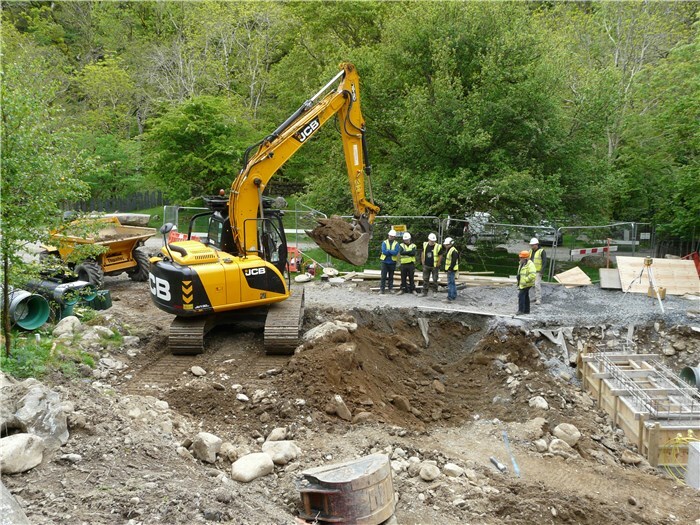 The river is diverted to allow the digger to install the pipes on the south bank which will carry the flow while the weir is built in the river bed. 29 July 2015 - a memorable day! 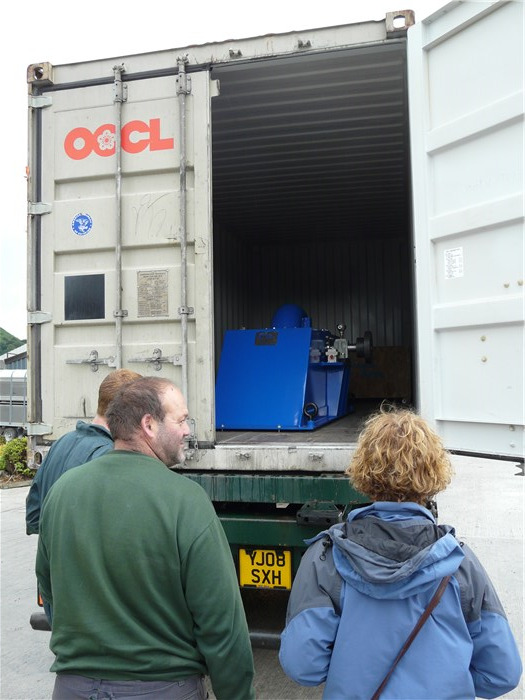 Our turbine arrives in Abergwyngregyn from the USA via Liverpool Docks. and manoeuvred through the doors. The trench for the diversionary pipes is prepared on the south bank of the river. 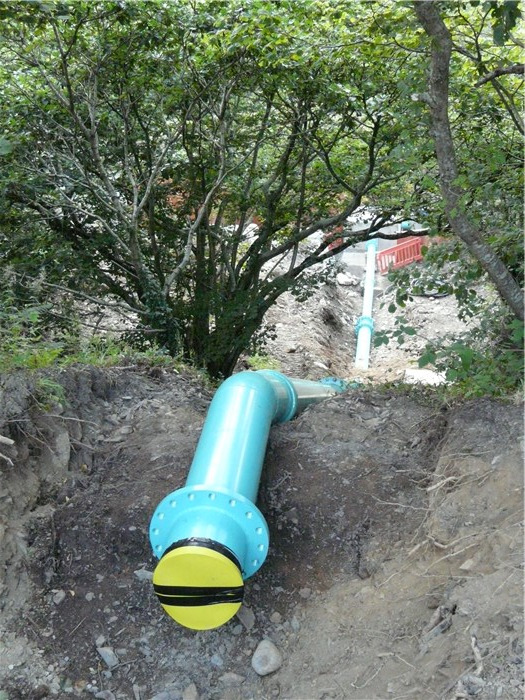 The pipes are installed and the river is diverted through them. 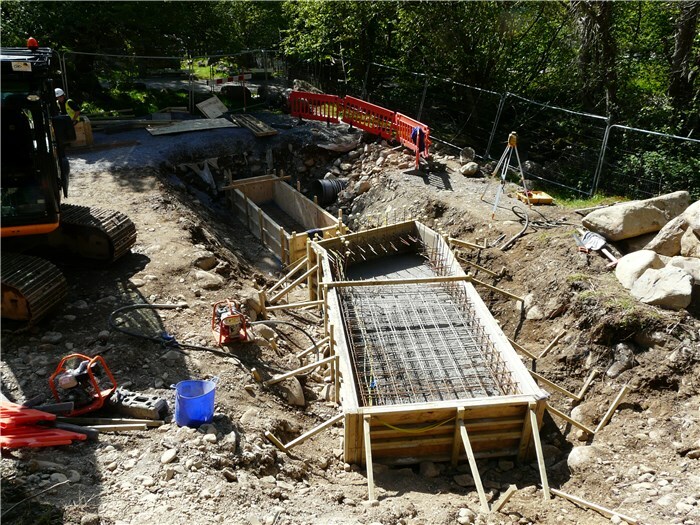 and the foundation is cast with the reinforcement for the weir wall in position. 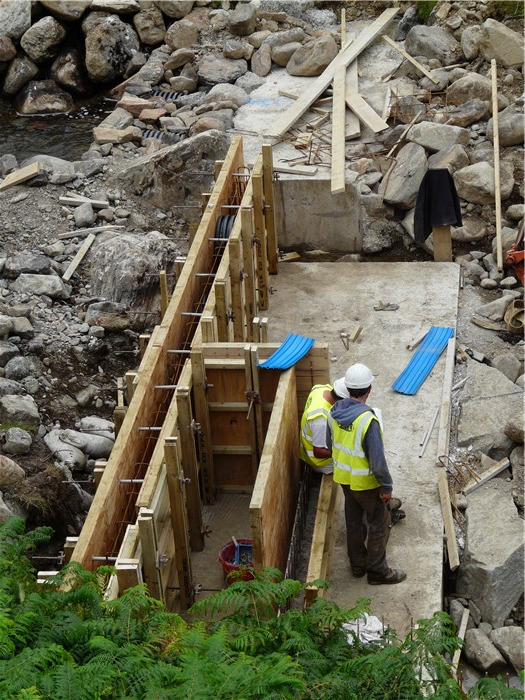 The shuttering is removed to reveal the structure of the weir wall. The roof is on ready for laying the sedum turf. 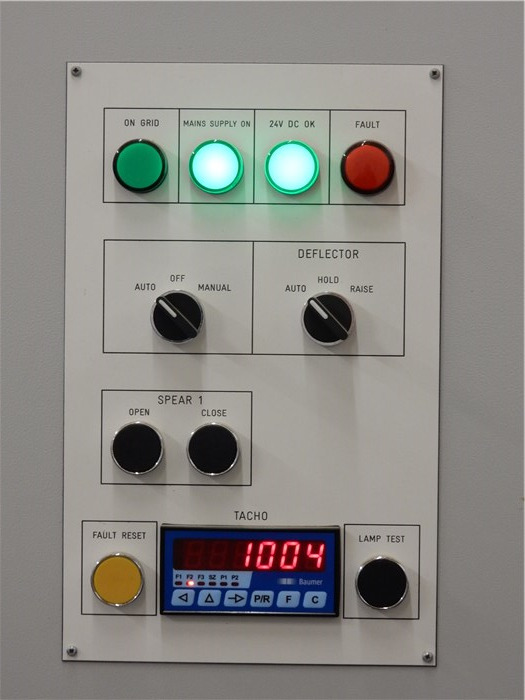 The generator and control equipment cabinets are installed. 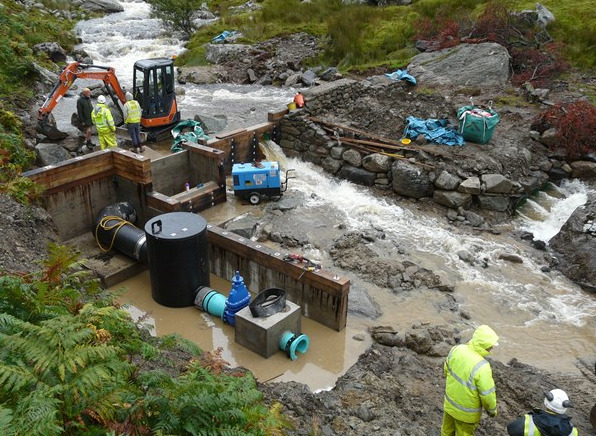 and the outlet returning the water from the turbine to the river nears completion. and the bank is reinstated. 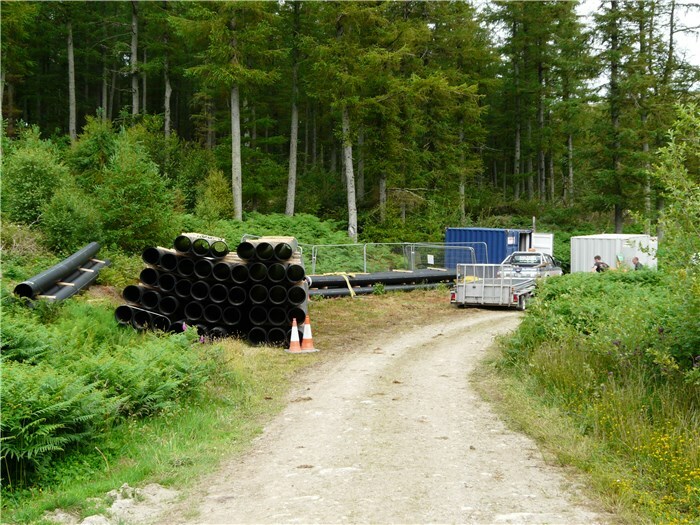 and the last section of the pipeline awaits installation at the bottom of the forest road. 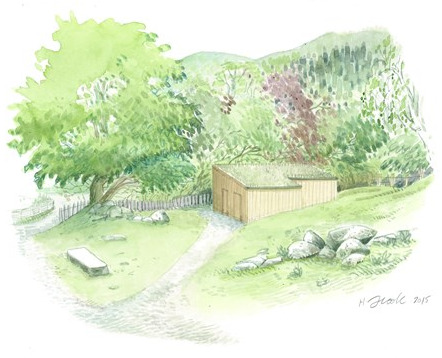 compared with the artist's impression published earlier. compared with the artist's impression. 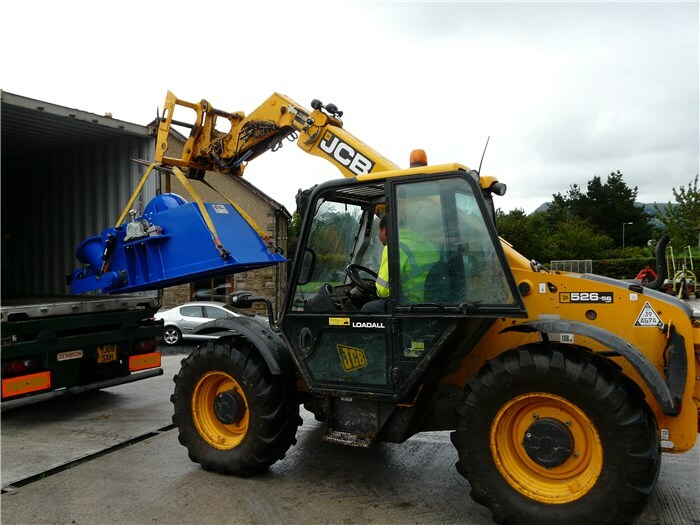 The steel pipe to take the water down the bank to the turbine house is delivered on site while Alfa Tree Services carry out some last minute tree clearance. 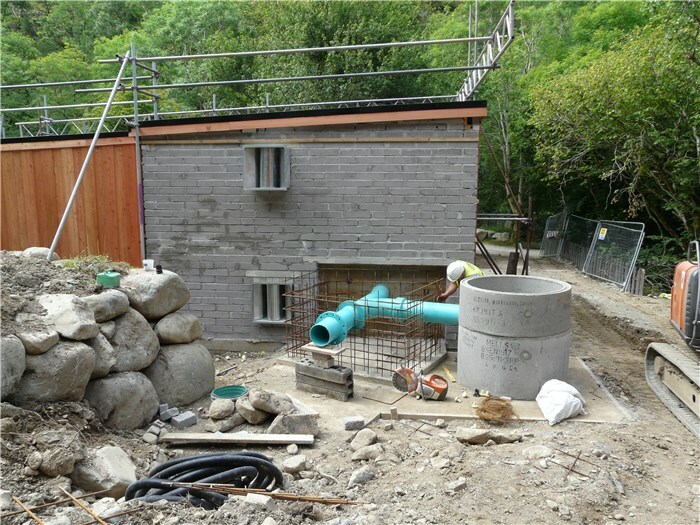 The steel pipe running down the bank to the turbine house is installed. 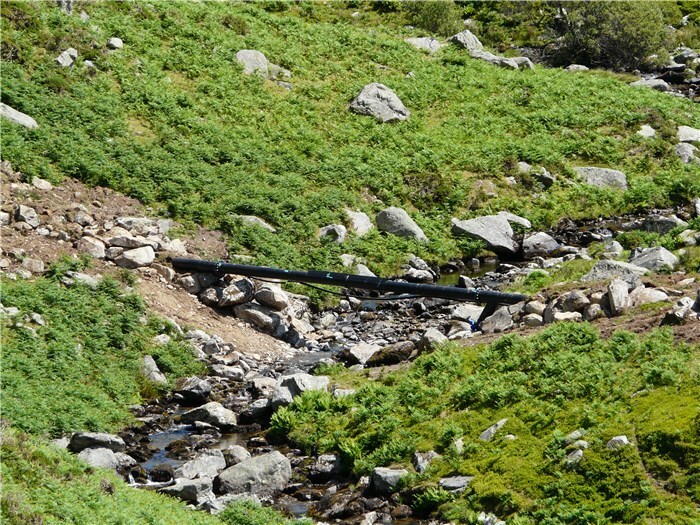 The last section of the polyethylene pipe is connected to the steel pipe down the bank to the turbine house. 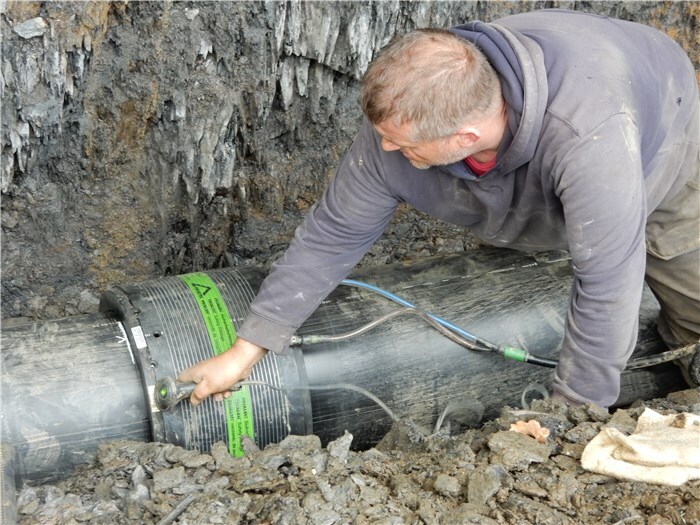 The exposed section of steel pipe is encased in its plastic insulating cover. 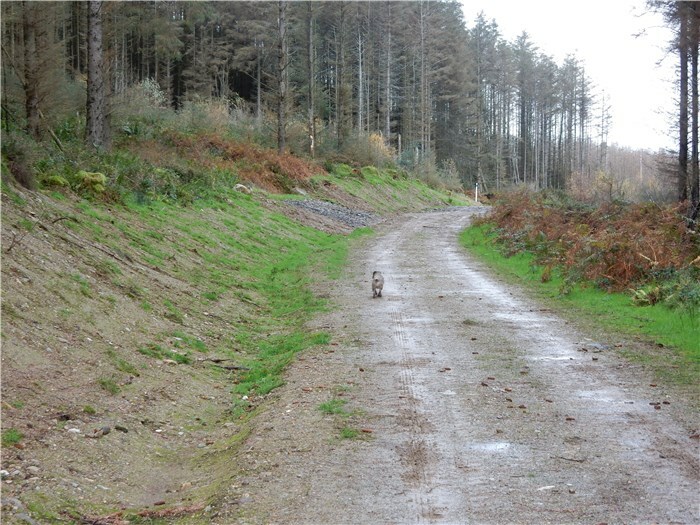 Kevin Williams encounters rock in Coedydd Aber Forest. 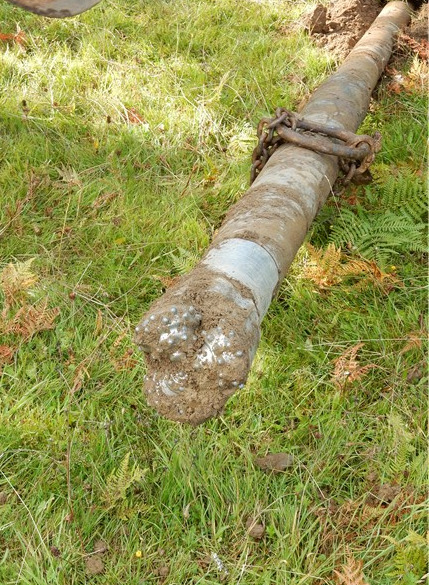 The final section of pipe in its trench through rock. 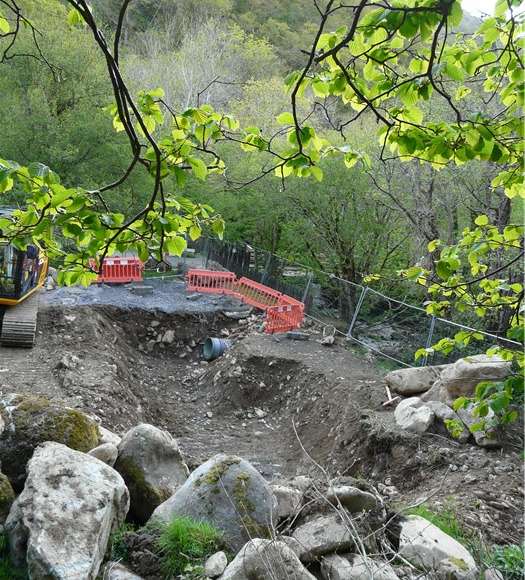 Stone walling in progress on the southern bank. 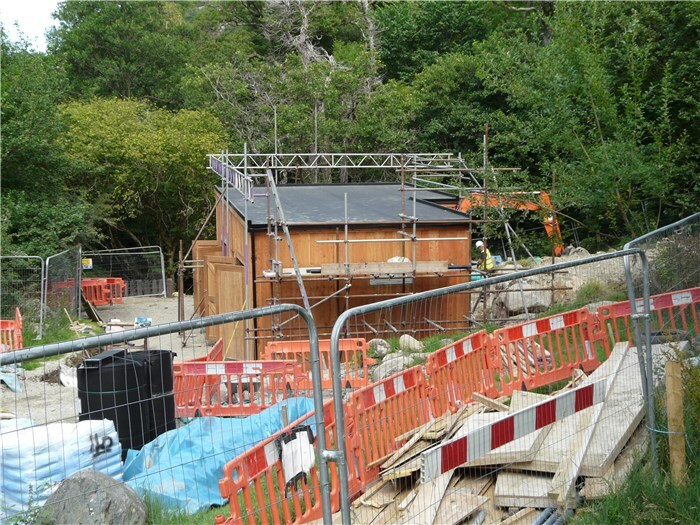 The oak cladding of the weir walls is complete. 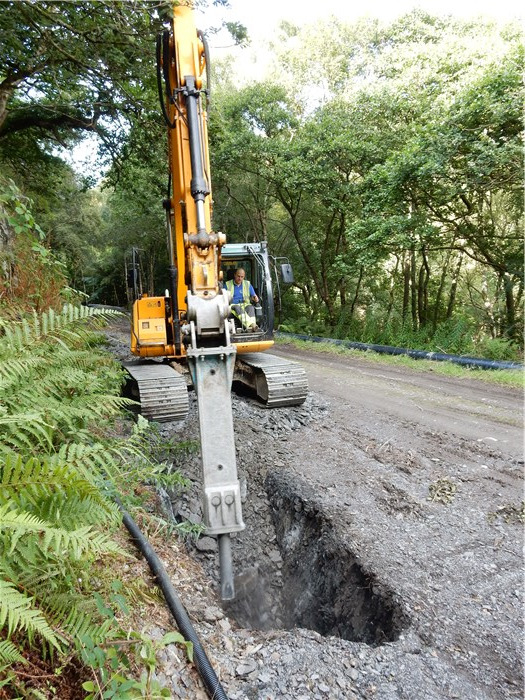 Heavy rainfall overwhelms the diversion pipes and floods the working area temporarily - 6 September 2015. 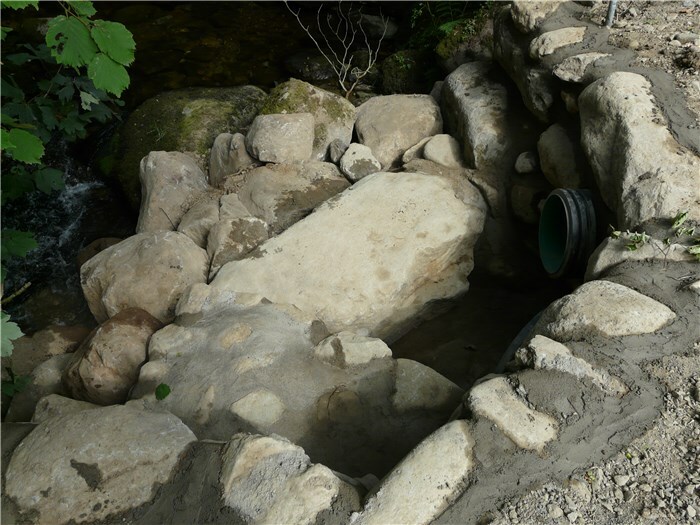 The stone walling on the south bank is completed and the trench is dug for the last section of pipe to the weir. 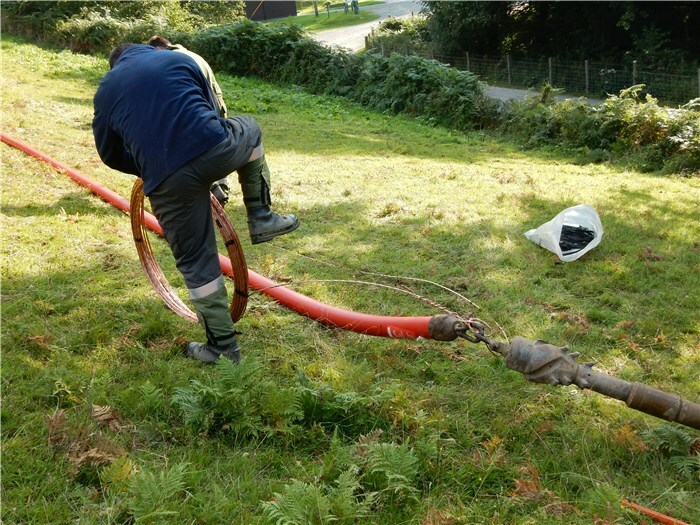 The pipe connecting the buried pipeline to the weir in its trench. 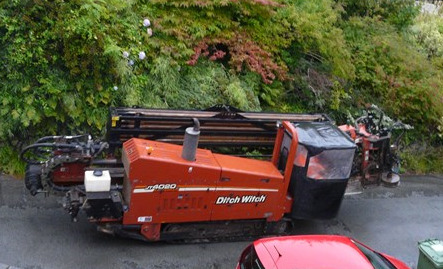 The Ditch Witch, Scottish Power's directional drilling rig, is tracked up through the village to the turbine house. 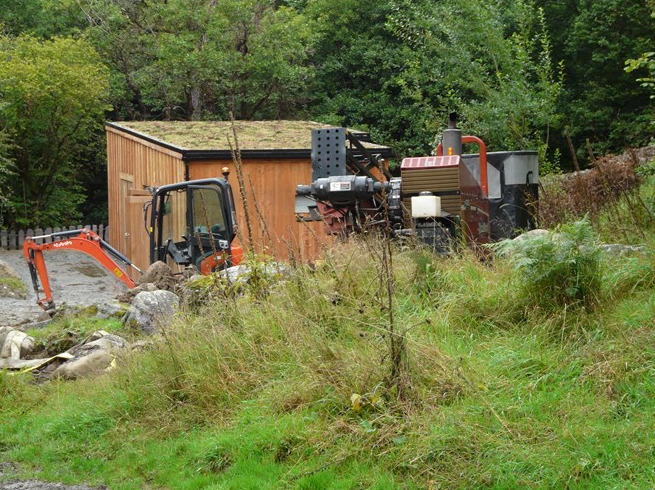 The Ditch Witch in position behind the turbine house. The rig starts drilling under the river for the grid connection cable - 2 September 2015. 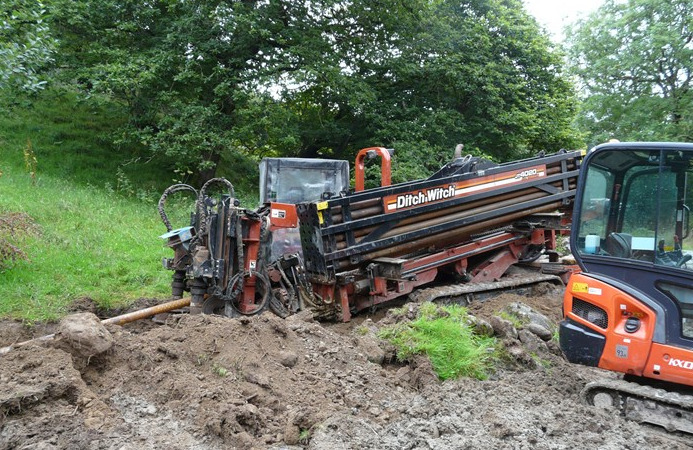 The drill emerges near the pole which will receive the grid connection on the other side of the river after passing through bed rock 4 m below the river bed. The red plastic duct for the grid connection cable and earthing wires are attached to the reversing head. 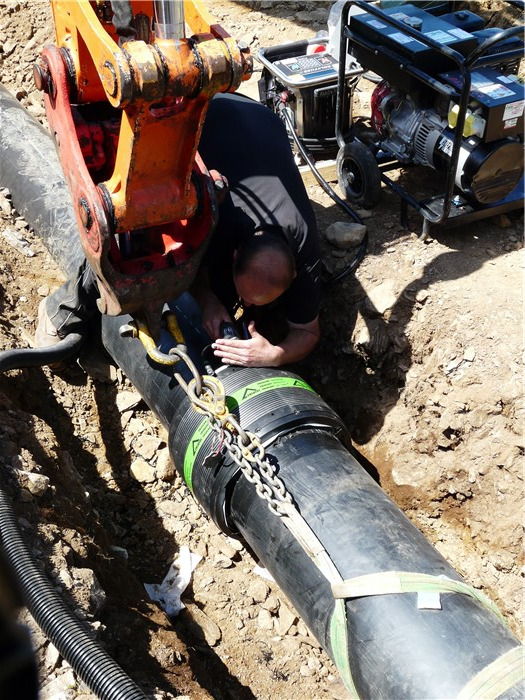 The drill rod and spinning reversing head, with the plastic duct and earthing wires attached, is pulled back down the drill hole. 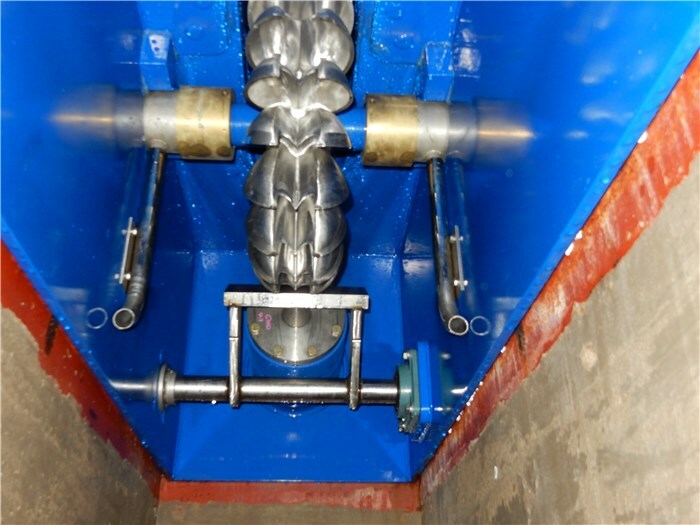 The plastic duct for the grid connection cable is dragged back under the river to the back of the turbine house. 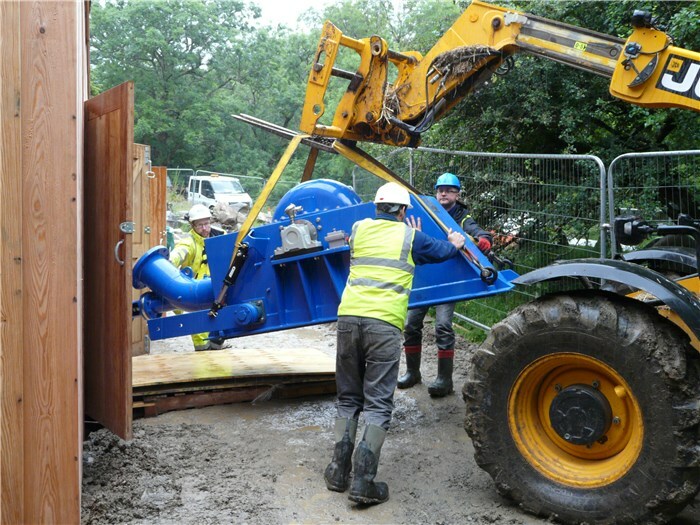 The coanda screen through which water is extracted from the river flow and diverted into the pipeline is installed - 9 September 2015. Detail of the coanda screen showing the slots through which water is abstracted. 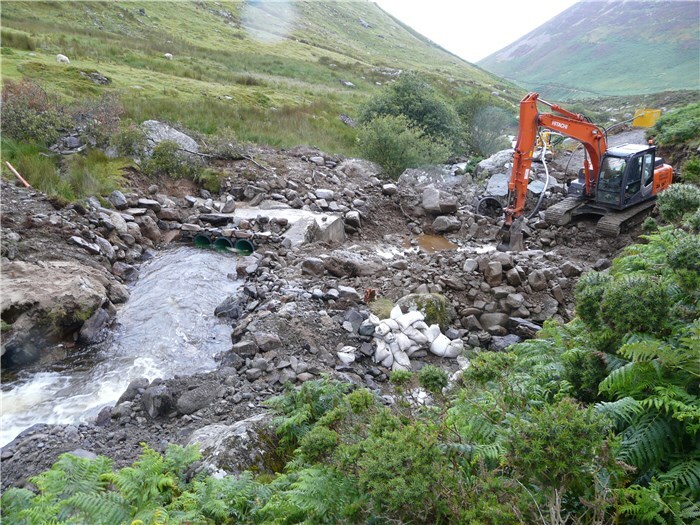 The diversion pipes are capped and the weir is flooded. Turbidity downstream 1 hr after the weir was flooded; by the time the flow reached the pipe bridge, the flow was clear. The flow is clear at the weir 4 hr after flooding. 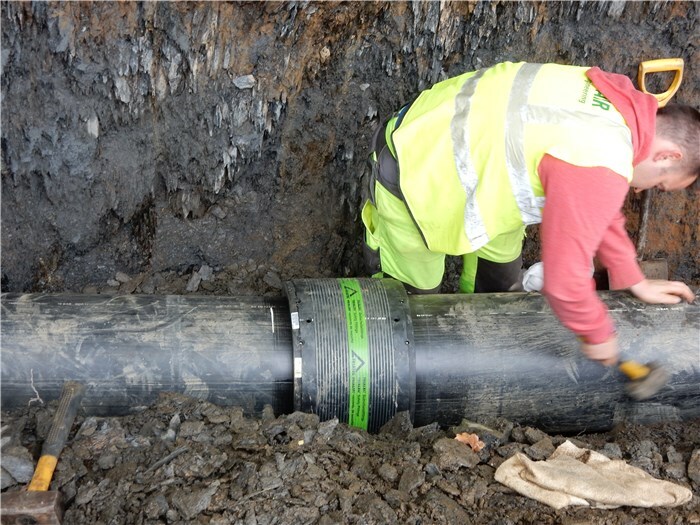 The pipe is aligned for the final joint. 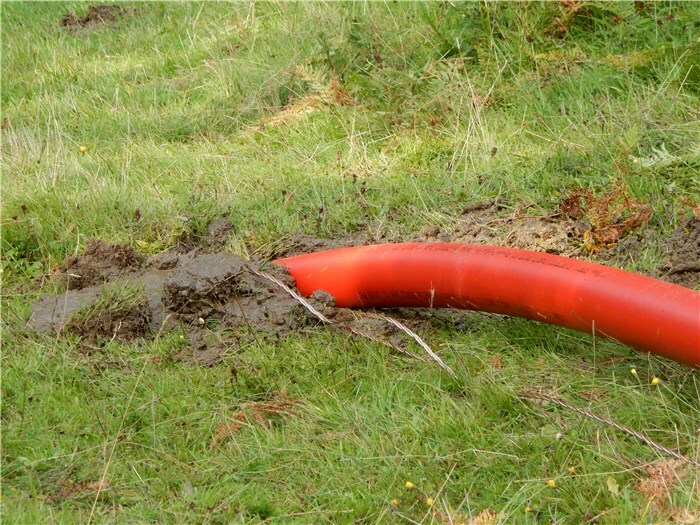 Thirty metres of surplus pipe can be seen in the background, all that's left from the 3 km pipeline! The welding coils built into the connector are activated to complete the final joint in the pipeline. 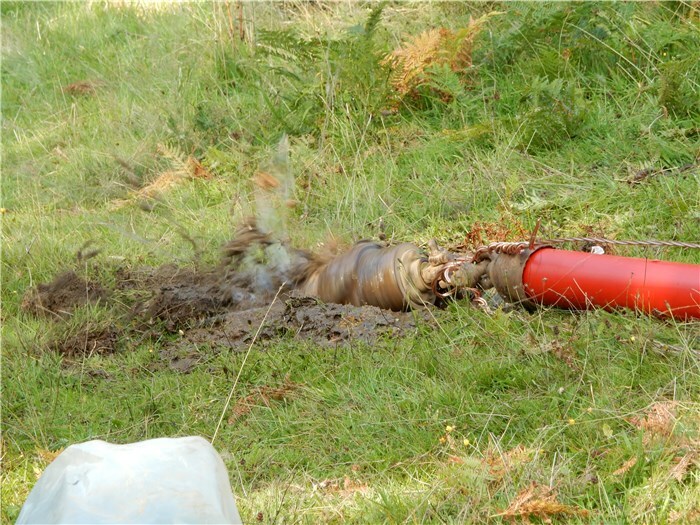 The upper section of the pipeline is flushed with water - 23 September 2015. The completed pipeline is flushed with water. 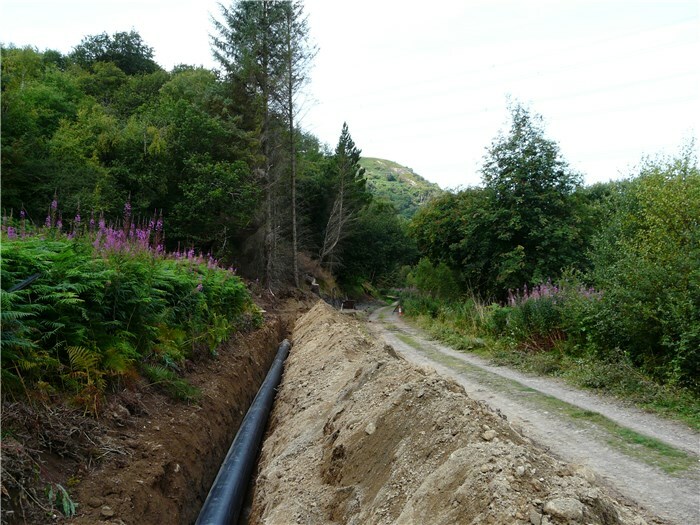 The bank over the buried pipeline through Coedydd Aber Forest recovers well. Mission Accomplished! 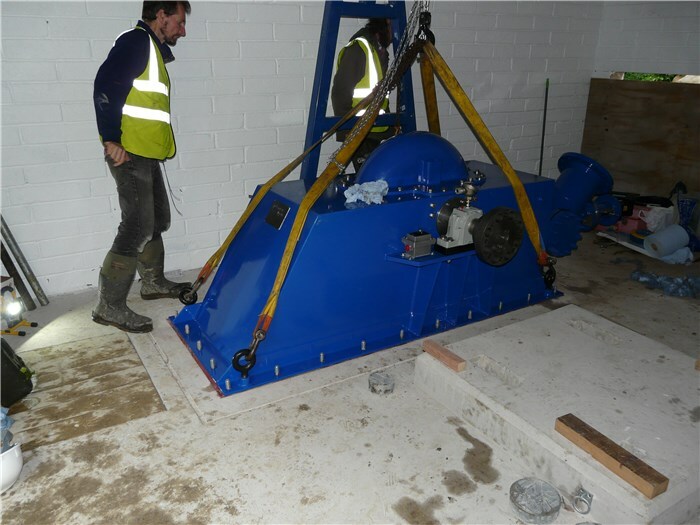 The Anafon Hydro is up and running a month ahead of schedule and exporting 270 kW to the grid. Investing in Ynni Anafon Energy Cyf. Our share offer was launched by the naturalist and broadcaster, Iolo Williams, at a festival in Abergwyngregyn, the Aber Dabba Doo, on 13 September 2014 which attracted approximately 1,000 visitors to the village. 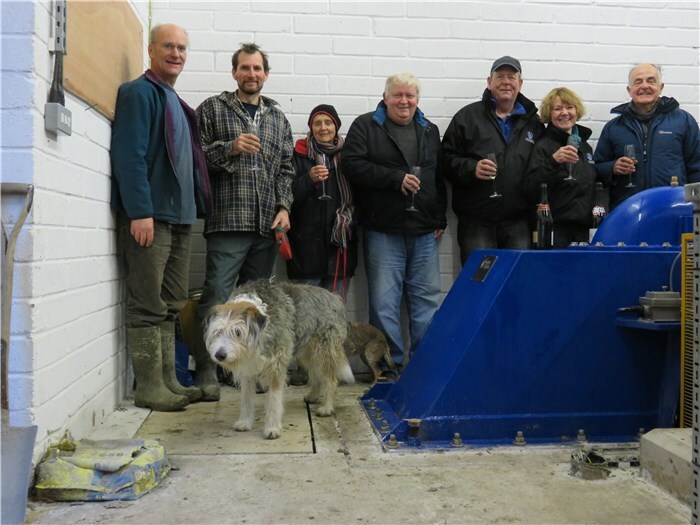 The opening share offer raised over £325,000 before the closing date of 30 November 2014. The significance of this date was that we had set ourselves a target of £300,000 to be raised by then before we could commit to building the Anafon Hydro. As you see, we surpassed this target and proceeded with the project. The total raised from the sale of shares was £450,900. We thank our shareholders for investing in the Anafon Hydro. Every additional pound raised from shares reduced the amount we had to borrow from the bank in the form of an expensive loan. All investment attracted substantial tax relief of either 50% or 30% of the amount invested through HMRC’s Seed Enterprise Investment Scheme (SEIS) or Enterprise Investment Scheme (EIS) and the company will be paying interest, initially of 5%, from Year 3 of generation. If you, as a shareholder, have not already applied for your tax relief under the SEIS or EIS, you should do so with the appropriate forms you will have received from Sharenergy who administer our share scheme. You can make your claim now or for up to five years after the 31 January following the tax year in which the investment was made. The actual amount of tax relief you can claim will depend on your personal tax circumstances. 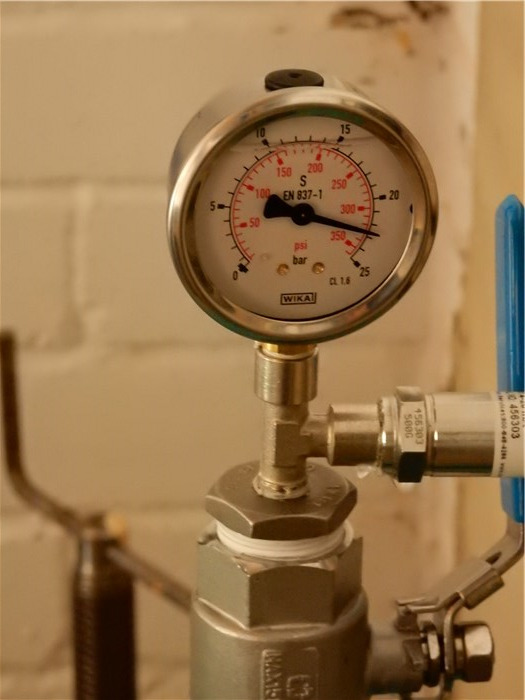 The benefits of your investment in Ynni Anafon Energy? 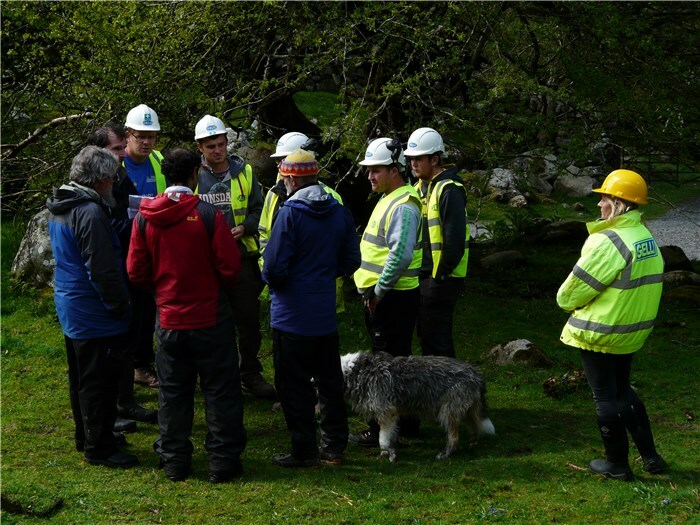 As a shareholder in Ynni Anafon Energy Cyf., you are playing an active part in the first large-scale community-owned hydroelectric generating plant in North Wales. 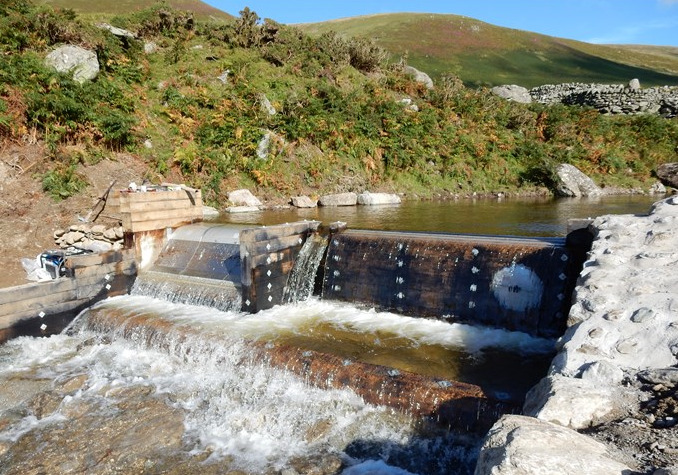 With your help, we have been able to harness the waters of the Afon Anafon to generate renewable electricity, to support local communities and community projects and to provide you, our investors, with a financial return on your investment. You are helping to promote community renewable energy which has the potential to reduce significantly our reliance on fossil fuels and nuclear generation. We hope you feel proud to be part of this pioneering community enterprise, of your support for renewable energy and of your contribution to a greener and more sustainable future. 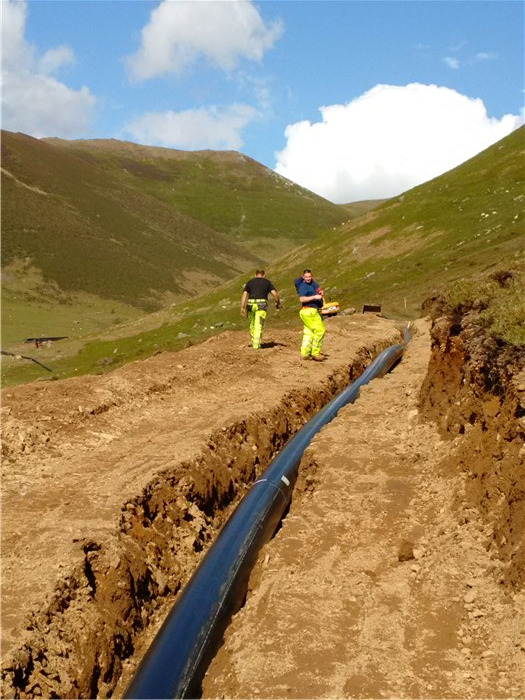 Shareholders will receive an annual payment of interest on the value of their shares starting in the third year after the hydro is commissioned. The level of interest is recommended by the Board of Directors and agreed with the Members of Ynni Anafon Energy Cyf. at their Annual General Meeting; it is anticipated that the interest rate will be 4-5% initially. Interest on the shares is paid gross so it is the investor’s responsibility to declare these earnings to HMRC. All shareholders will become Members of YAE with an entitlement to vote at the AGM. However, shareholders will have only a single vote irrespective of the number of shares they hold. Two classes of shares have been issued: A-Shares which were reserved for investors from the local community and B-Shares issued to the wider public in Wales and beyond. The Rules of the Society state that there will be up to 9 Directors, up to 4 be elected by A-Shareholders, up to 3 by B-Share holders and 2 nominated by the Abergwyngregyn Regeneration Company. Dwr Anafon is the charity set up to distribute the disposable profits from the Ynni Anafon Energy scheme. These are estimated to be around £30,000 per year. The trustees of the charity will consider applications for grants for a wide range of projects. 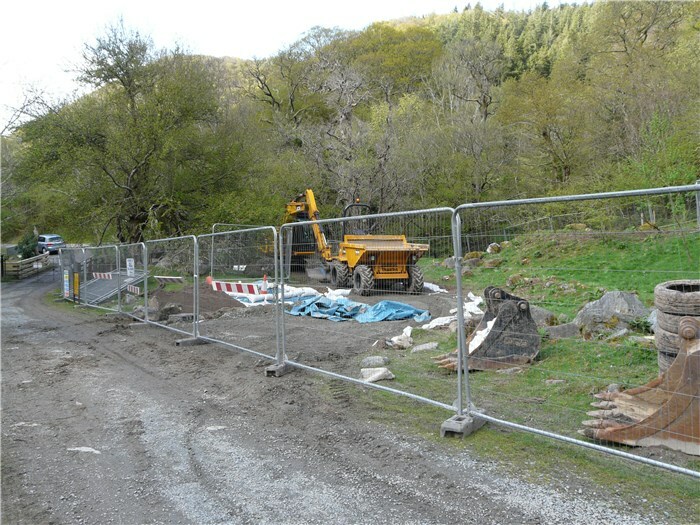 In the first instance this will be confined to projects within the village of Abergwyngregyn, with the expectation that the residents of the neighbouring village of Llanfairfechan will also be able to apply for grant money in 2019. Although in its infancy the charity has already donated money so that a defibrillator could be installed at Yr Hen Felin, in the middle of the village and funded Tai Chi classes for the benefit of local residents. Nick has lived in Llanfairfechan for fourteen years. 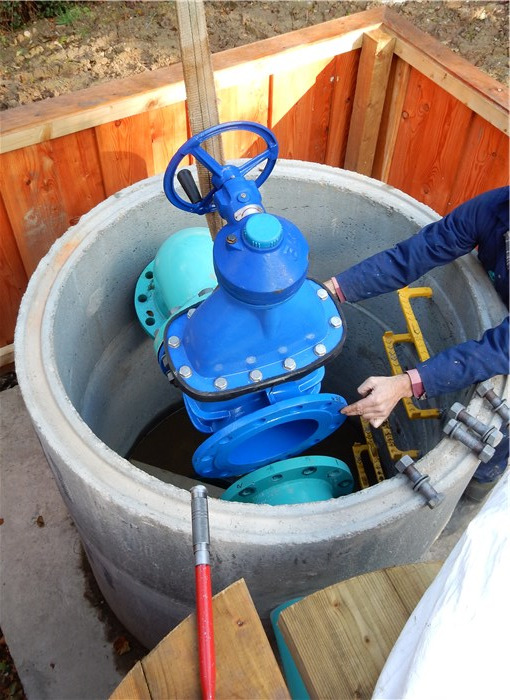 He is a Chartered Civil, Water and Environmental Engineer, having worked in the water industry for over thirty years and retiring as a Director of United Utilities. Since then he has been Chairmen of various not-for-profit companies and charities in Merseyside and as a JP in Liverpool and Conwy. He was made a Deputy Lieutenant of Merseyside in 2006. His current interests include Llanfairfechan Town Twinning, Rotary, volunteering for the National Trust and being a Member of Glas Cymru. He is married to Mairead and, together they have three grown up children and two grand-daughters. Jacqui has lived in Aber with her partner Ian since December 2011. Her past career was in education and in psychology. She ran a business in Liverpool providing child psychology reports in Family Court which enabled her to build up business and legal skills. She is a Director of ARC and was a founding Director of Ynni Anafon Energy, being actively involved in the creation of Anafon Hydro. Roger has lived in Abergwyngregyn since 2014, after spending 20 years living in Birmingham. He has a degree in Agricultural Biochemistry and a PhD in Microbial Biochemistry, having studied at Aberystwyth University. Roger has worked in the medical diagnostics industry for 25 years and now works as a Validation Engineer at Siemens Healthineers in Llanberis. He has two boys who are studying at University and lives in the village with his partner Susie. He has been a Director of ARC since 2015. Rita is married with two daughters who now live in Cardiff. She has lived in Abergwyngregyn for the last 42 years and had previously visited to stay with family every school holiday since she was 4 years old. She completed her nursing training at Manchester Royal Infirmary, and Midwifery and District Nurse training in Bangor. She worked as a Community Team Leader in Bethesda and Bangor for over 36 years, until retiring recently. Rita sits on the Committee for Aber Almshouses, ARC, Aber Snooker Club, and is Clerk to the Community Council. 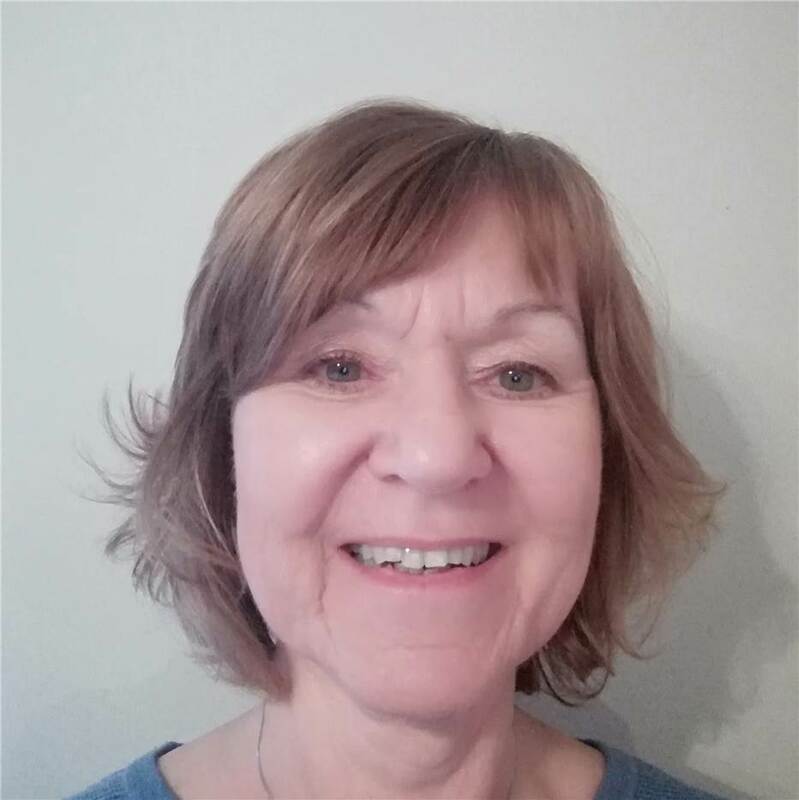 As somewhere which has always been close to her heart, she is eager to make a meaningful contribution to village life in Aber, and to ensure that the community works together to give its residents the best possible surroundings to live. This includes facilities, a sustainable environment and a safe neighbourhood where residents take care of each other, particularly its most vulnerable individuals. Chris Parry is from Llanfairfechan, born and bred. He enjoys outdoor activities and takes a keen interest in local charities and clubs. Chris was educated in Ysgol Friars, Bangor, and is now the Head of Mathematics and Senior Teacher in the same school. He is married and has 2 children in Ysgol Friars too! Chris has been on the board of trustees since 2017 and is our treasurer. Sheila has lived in Aber for 32 years. 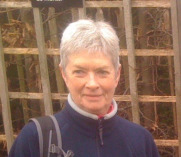 She was employed for 22 years, until her retirement, as a Retail Manager and Product Range Developer for the National Trust at Penrhyn Castle. She now works as a Retail Volunteer in Aberconwy House. Her hobbies include DIY, sewing, gardening, reading and eating out.